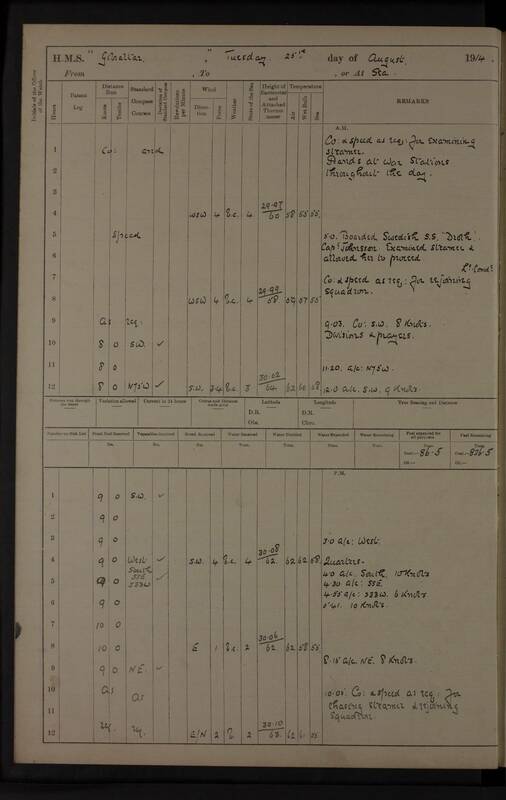 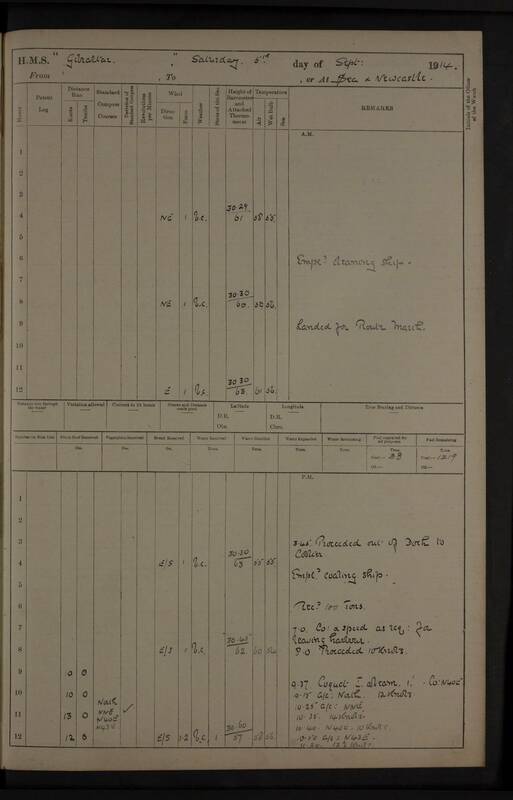 More information about HMS Gibraltar can be found in the log books of HMS Crescent and HMS Endymion for much of this period. From the start of the logs until 4 August 1914, HMS Gibraltar operated in the western English Channel and Irish Sea, as far north as the Firth of Clyde. 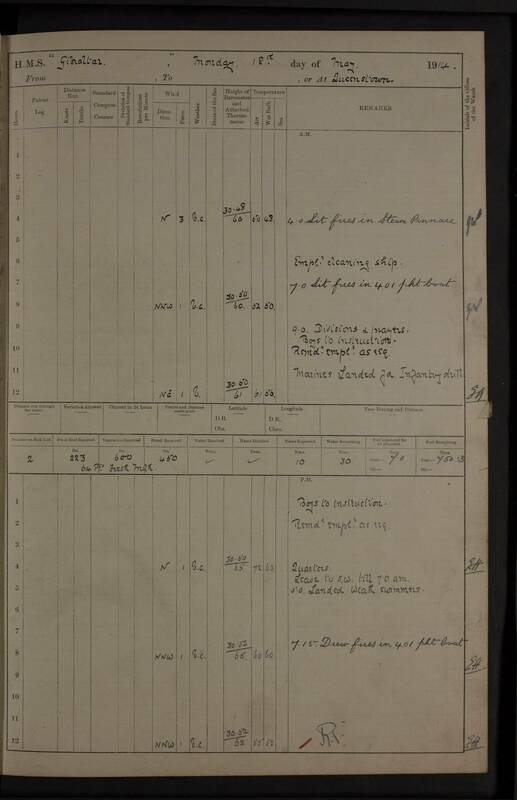 On 6 August 1914, she relocated to Scapa Flow and she spent the rest of the period covered by the logs patrolling in the northern part of the North Sea. For much of this latter period, positions were not recorded in the logs; hence the disjointed nature of the displayed tracks. 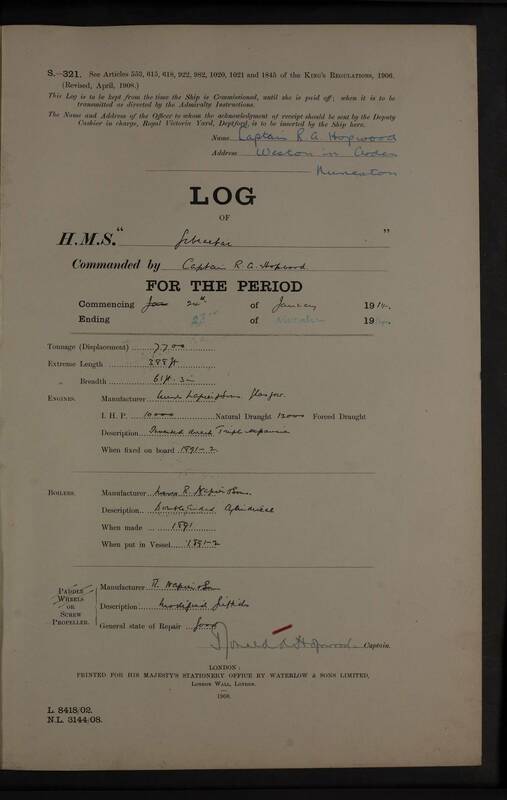 9.30 am: Held Court Martial on board. Mr. Charles D. Lyon, Boatswain, dismissed ship by sentence of Court martial. 3.45 pm: BELLEROPHON proceeded out of harbour. 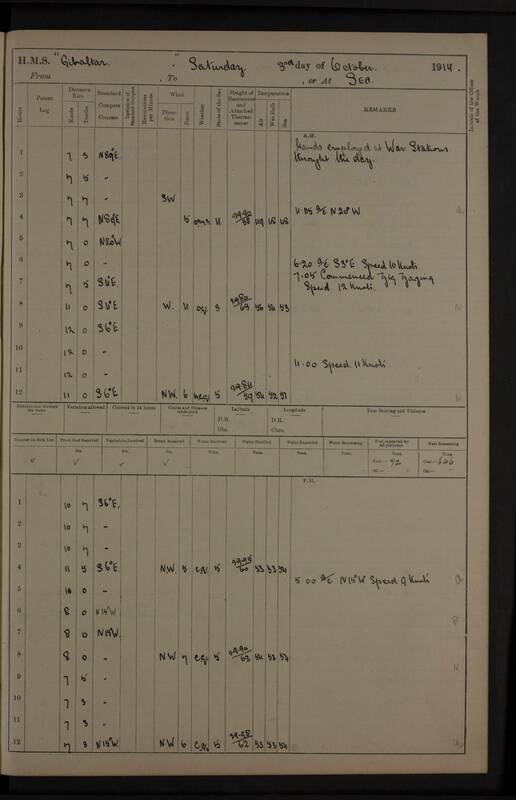 6.30 pm: Made fast to No 2 buoy. 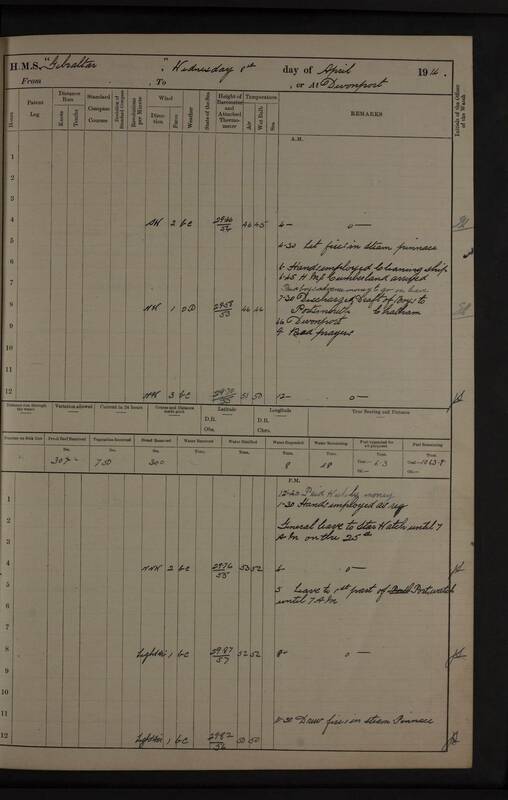 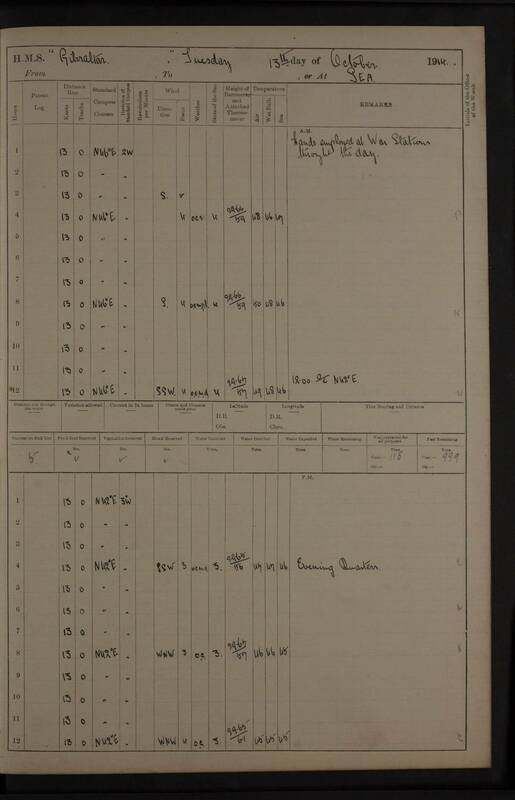 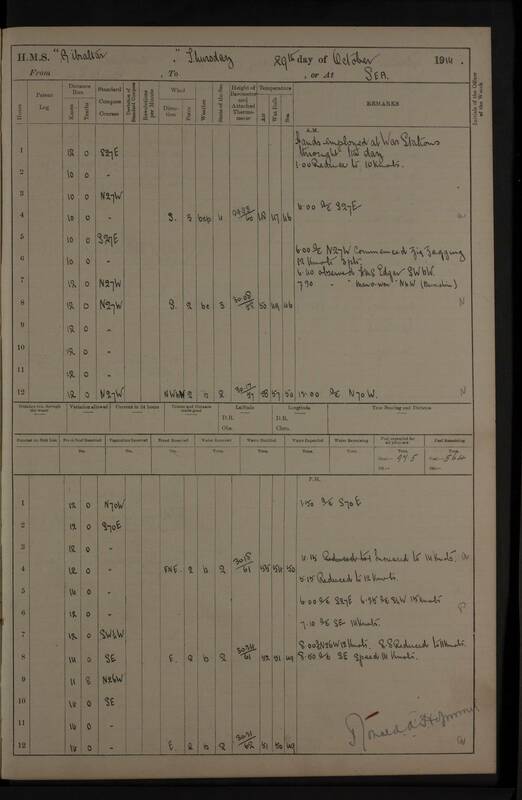 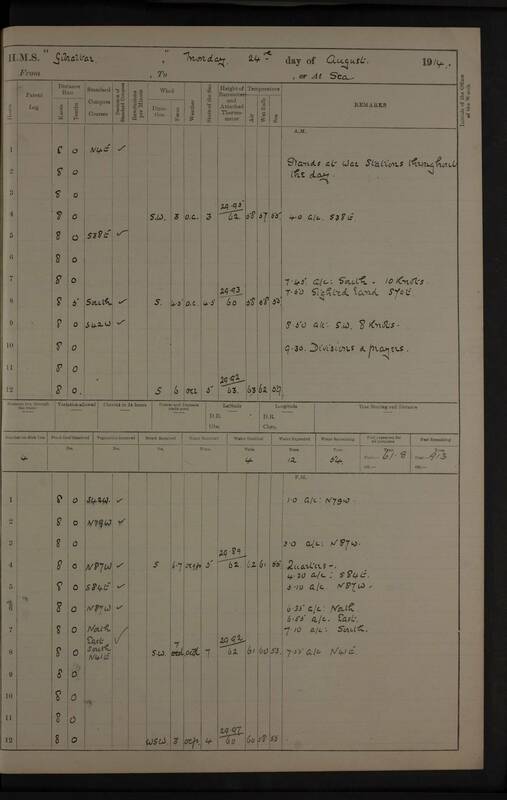 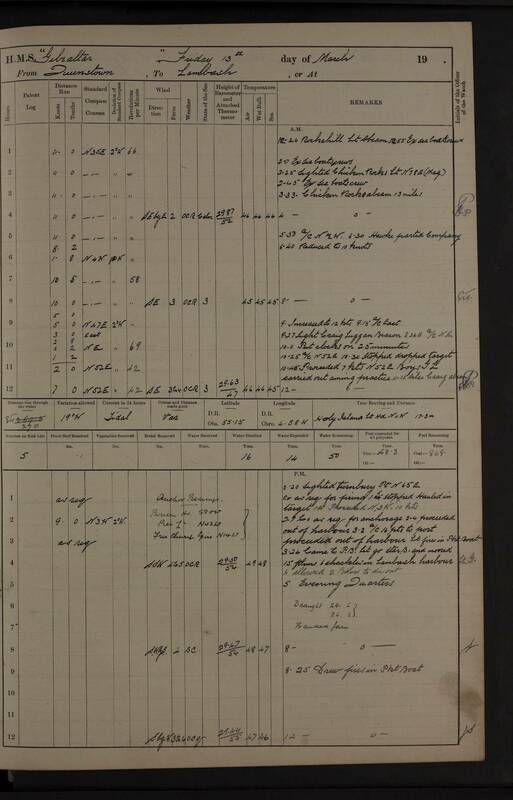 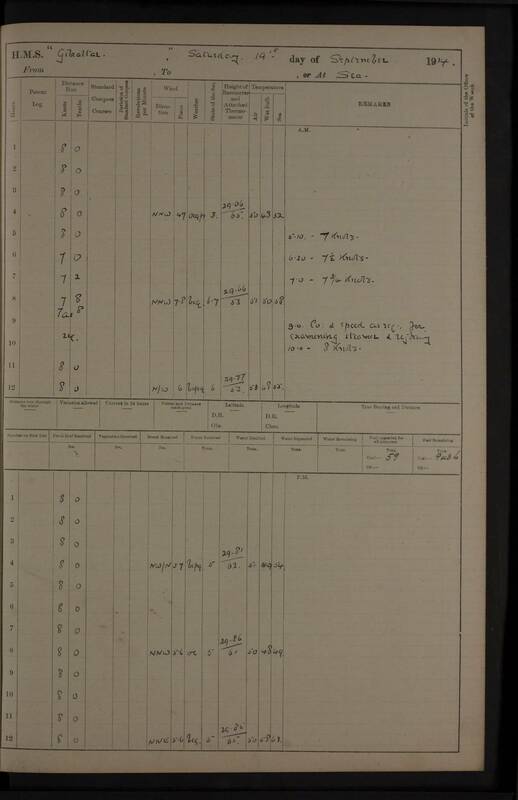 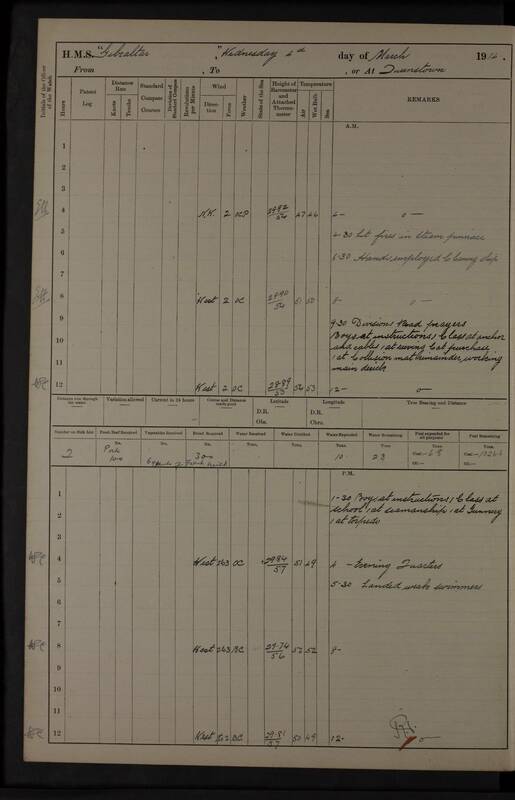 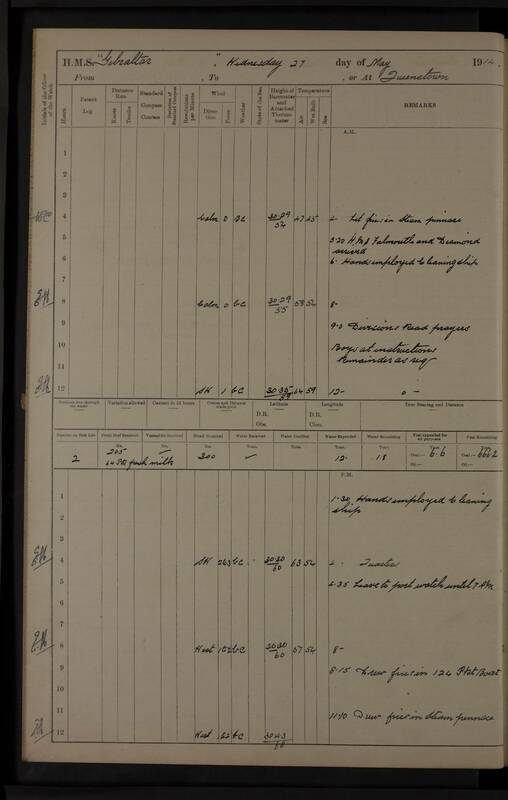 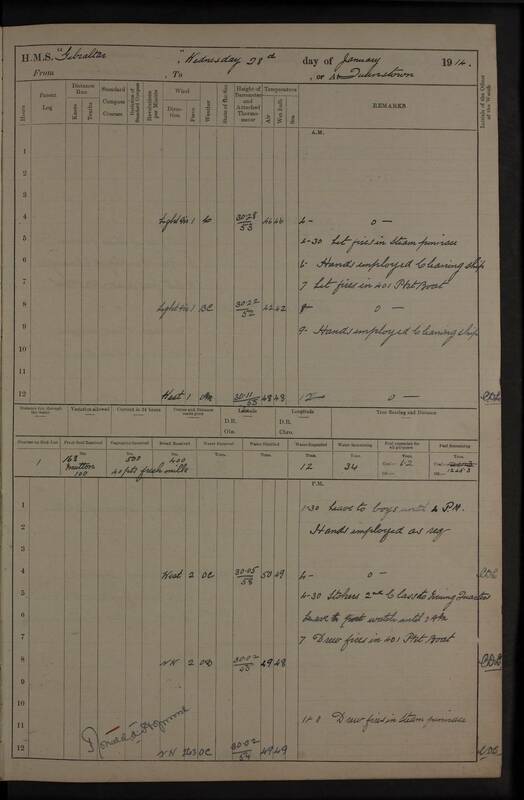 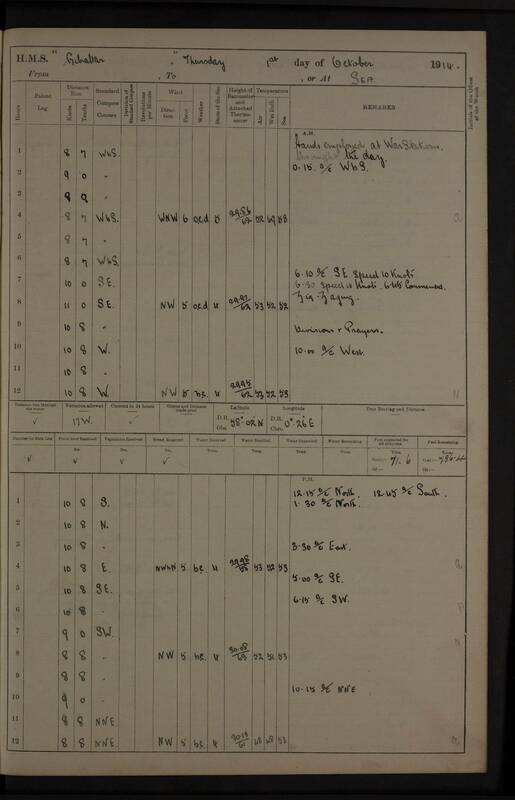 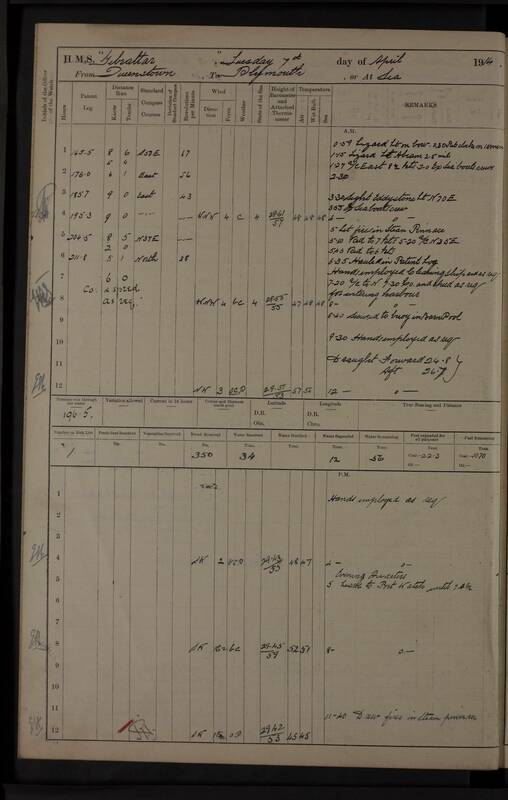 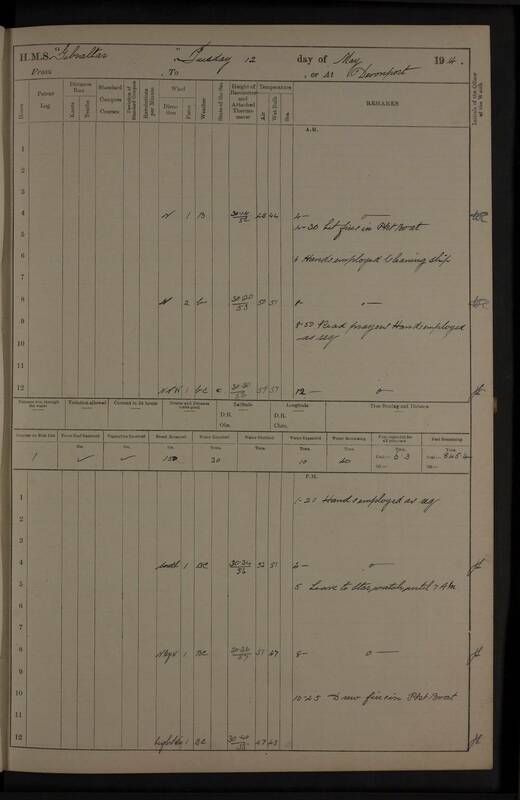 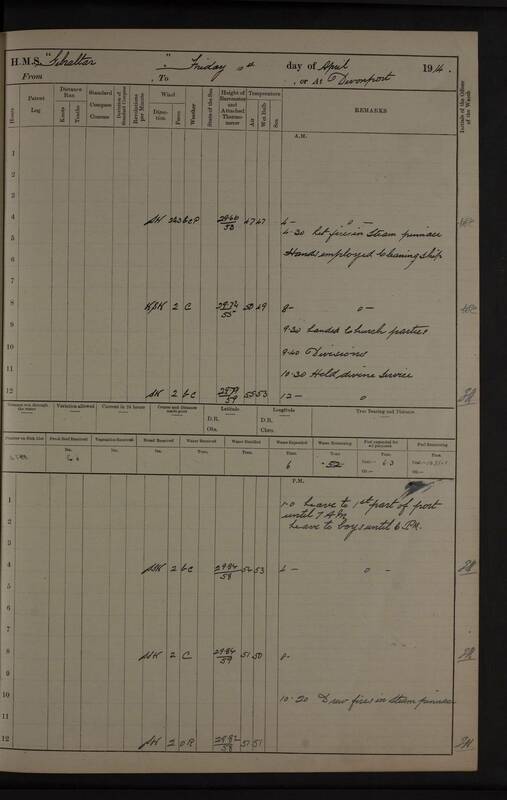 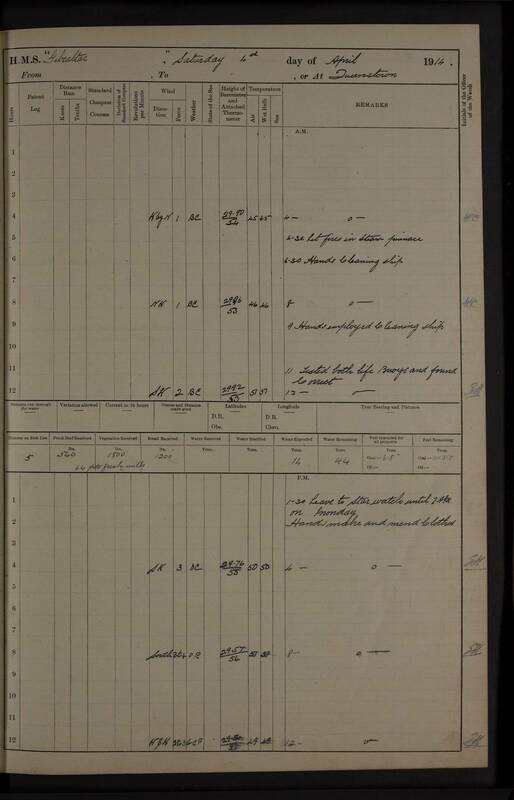 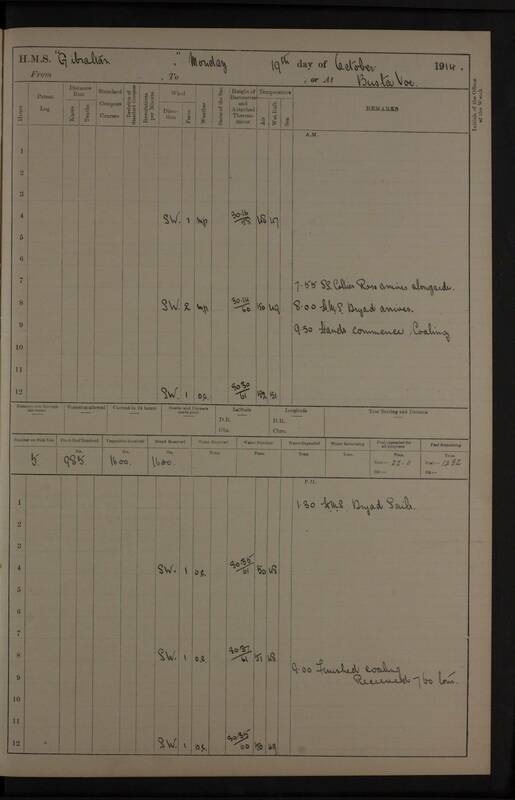 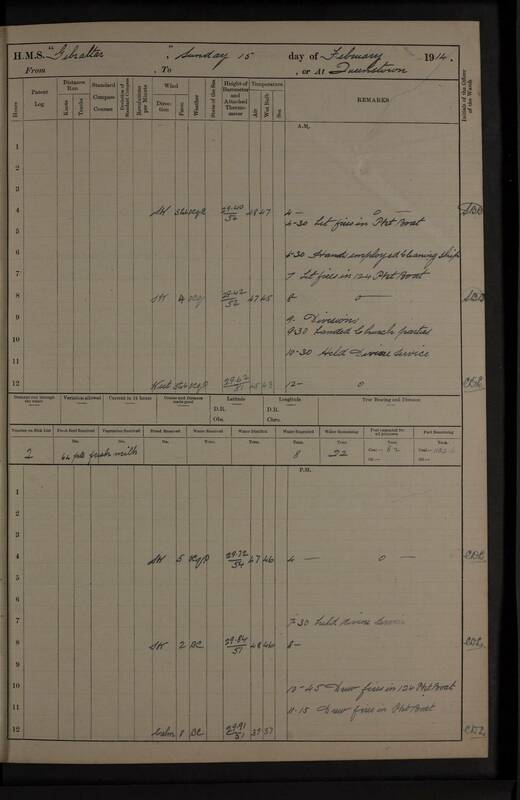 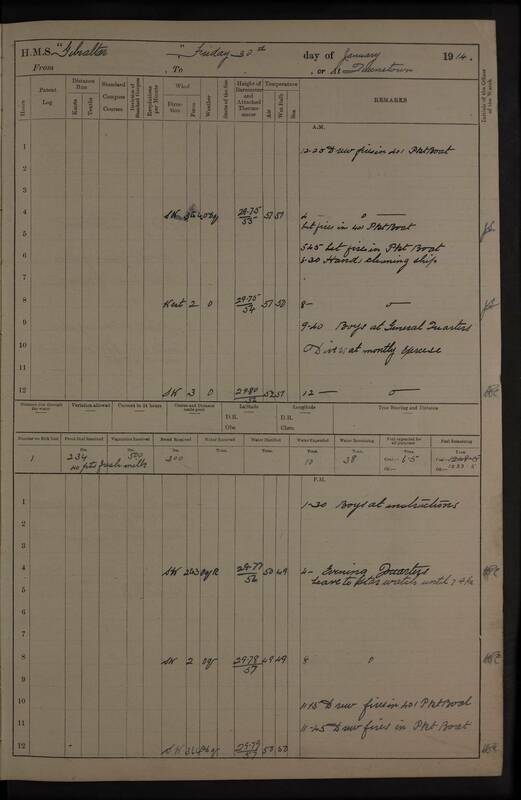 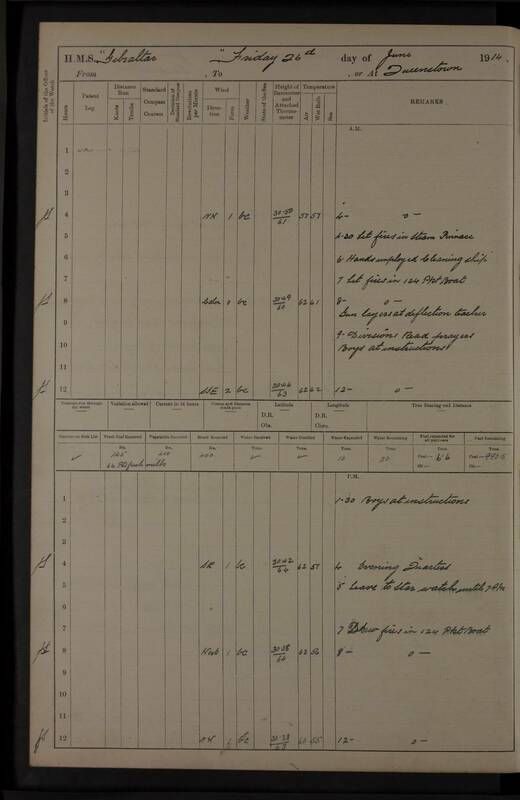 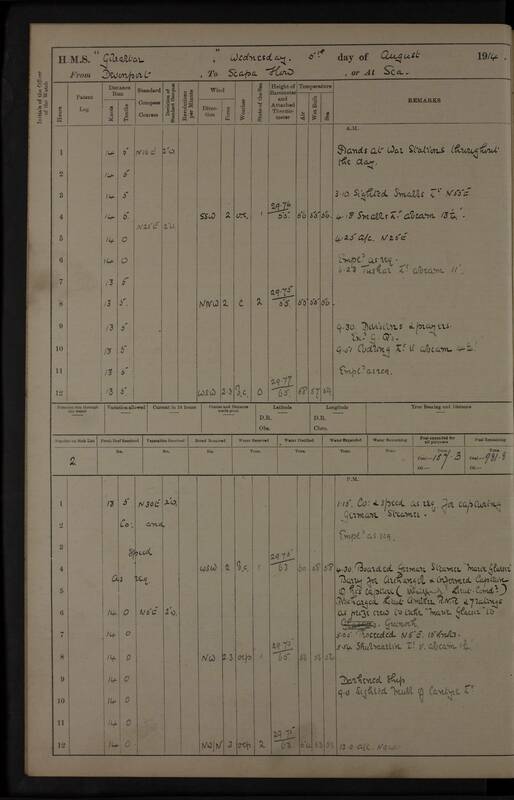 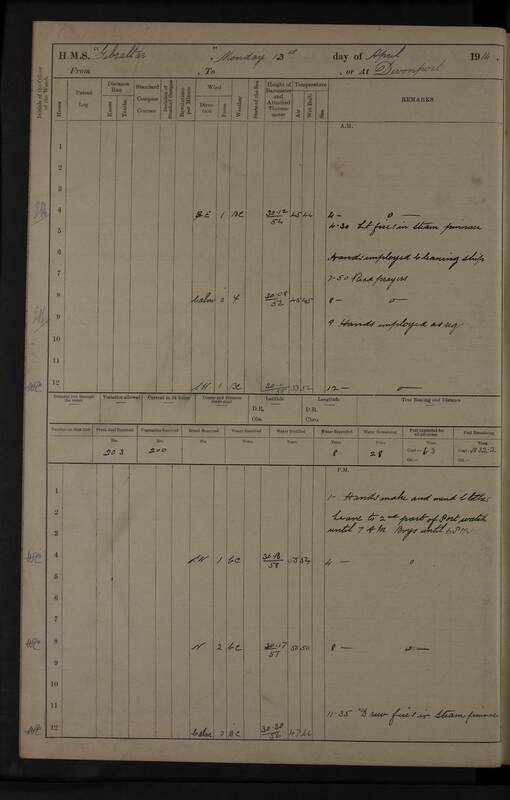 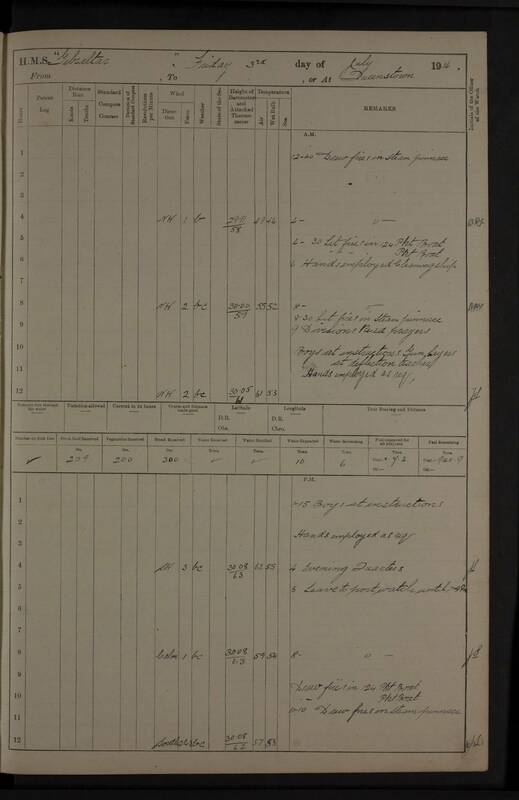 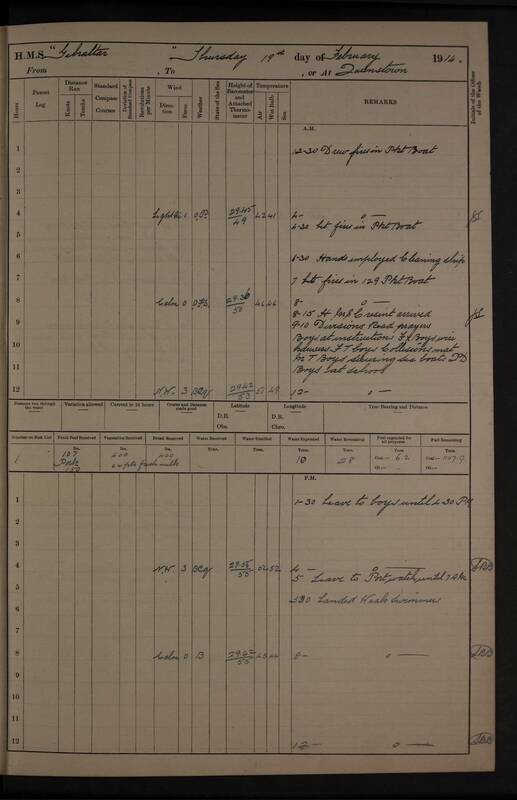 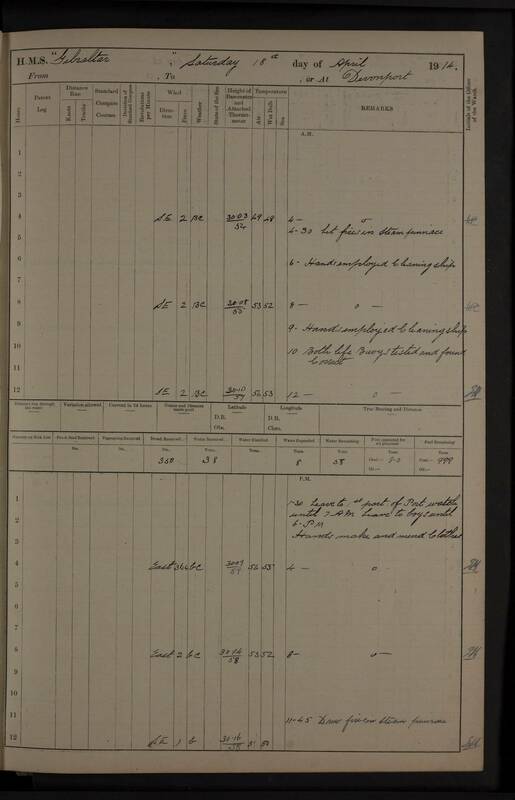 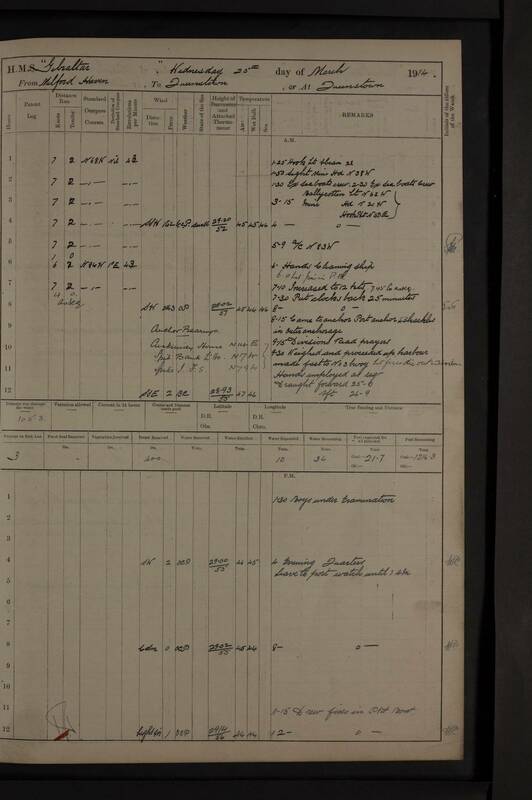 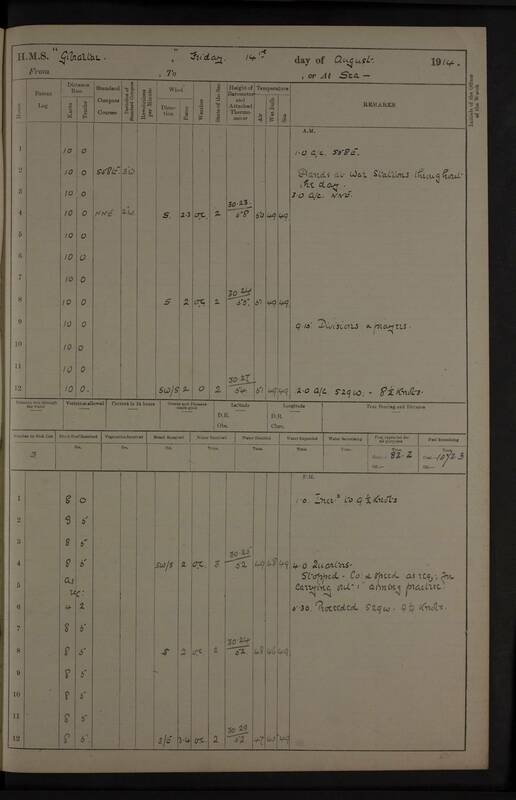 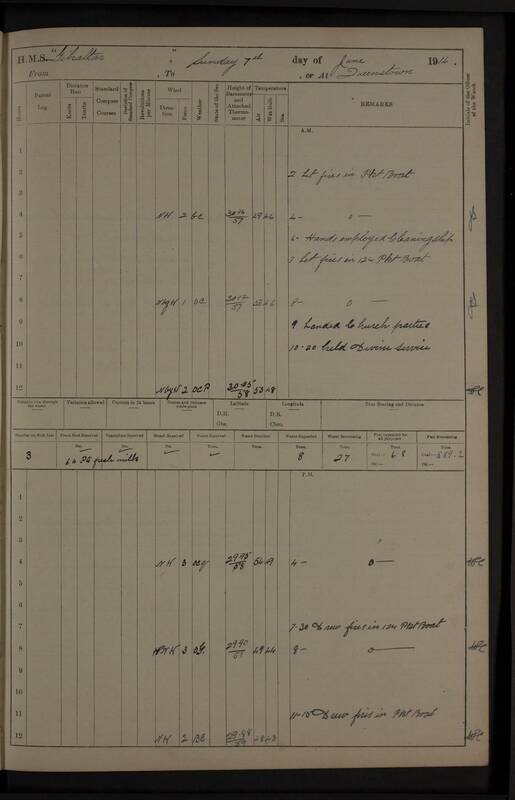 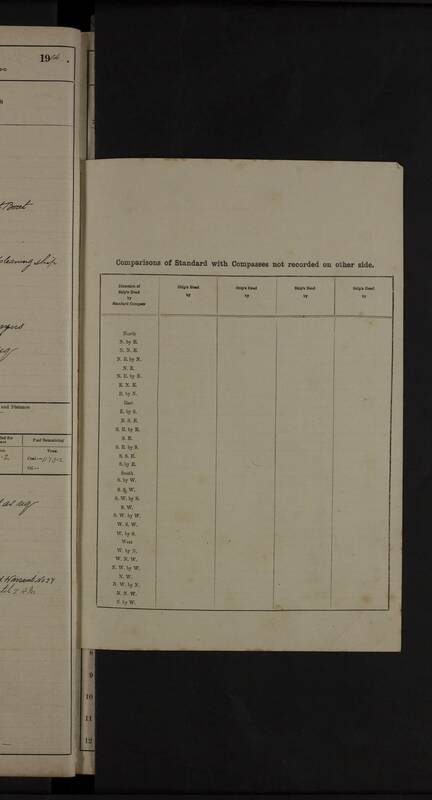 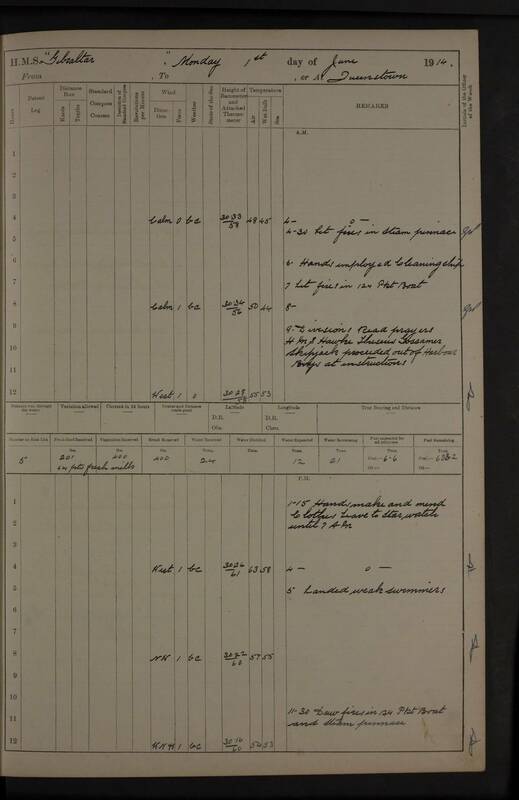 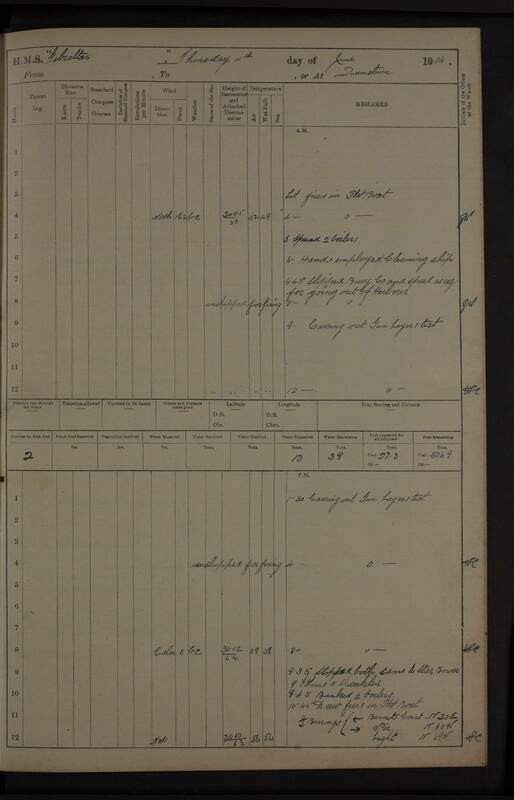 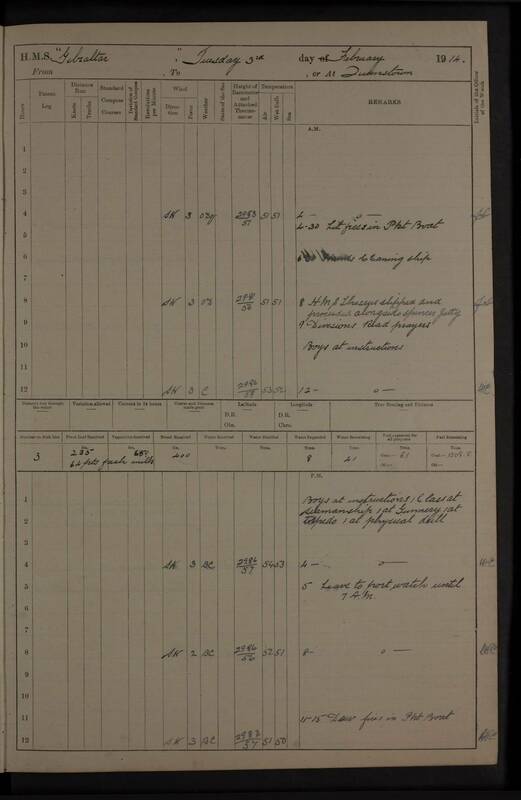 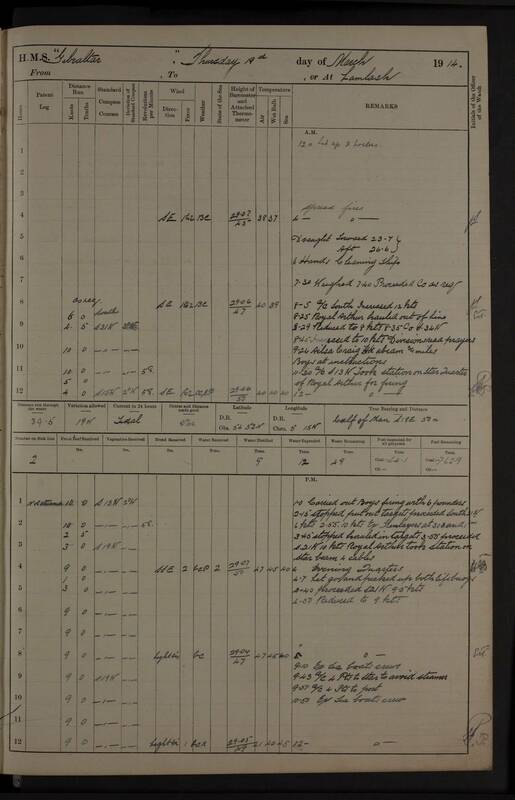 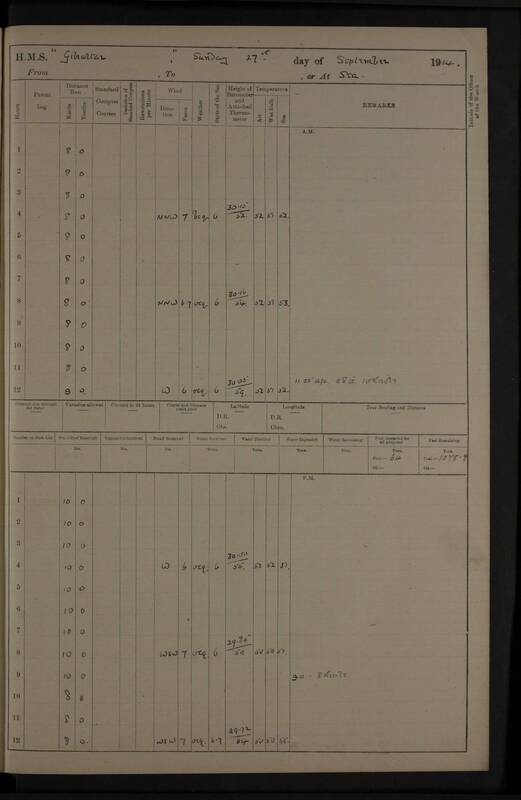 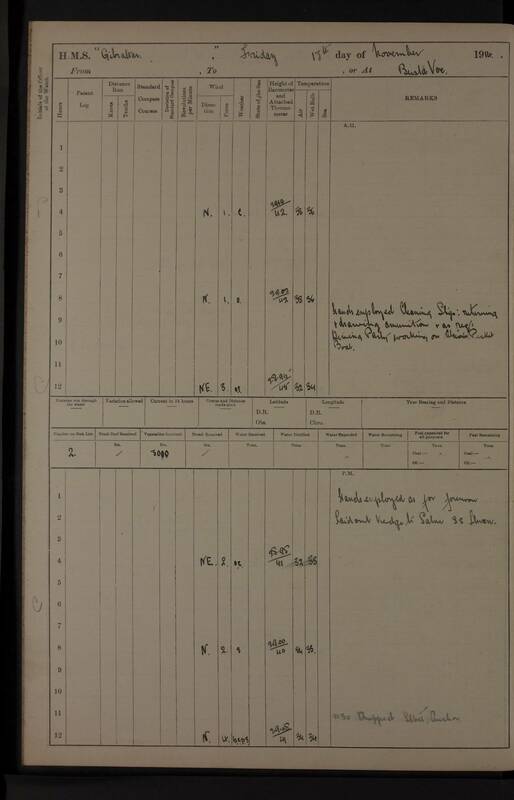 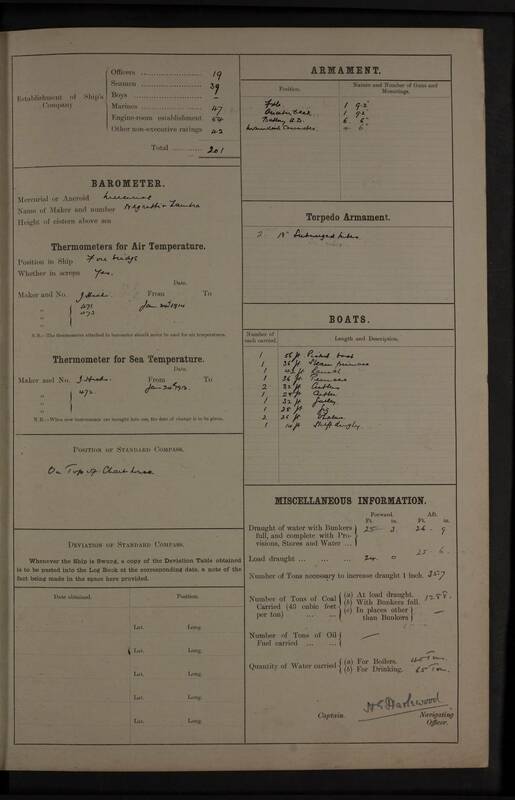 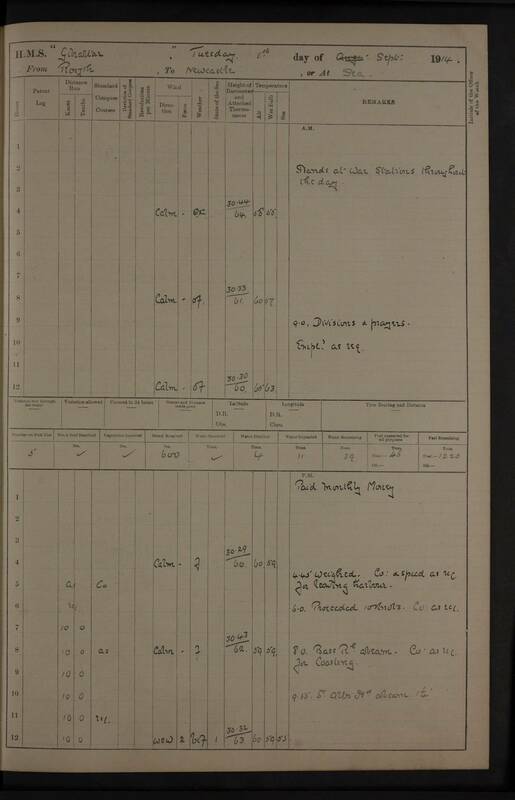 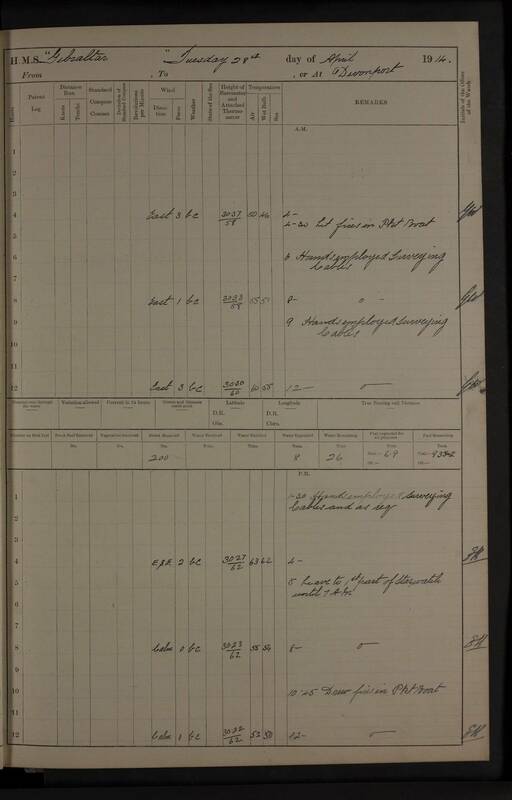 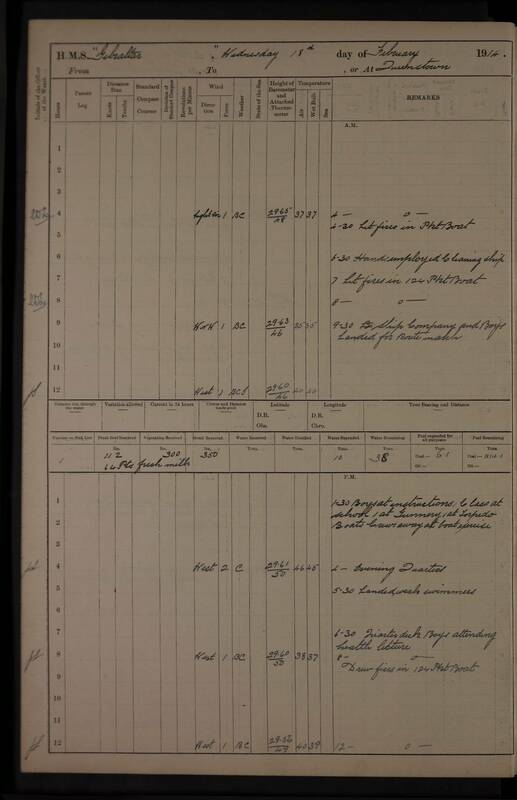 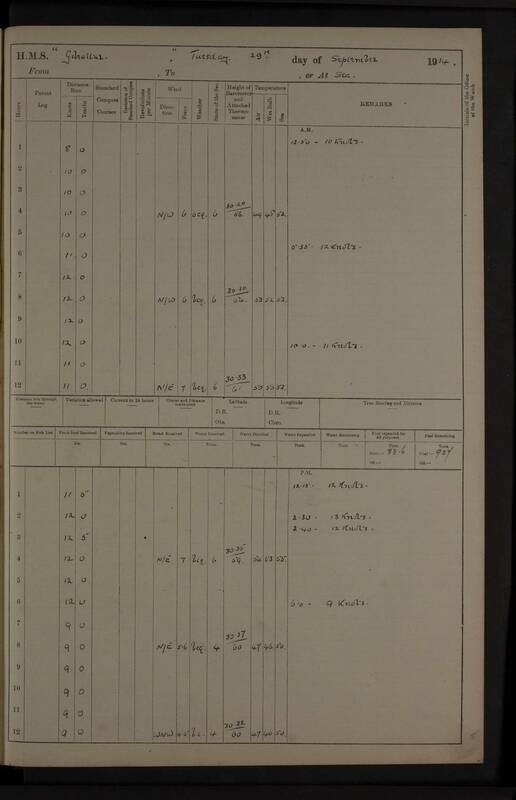 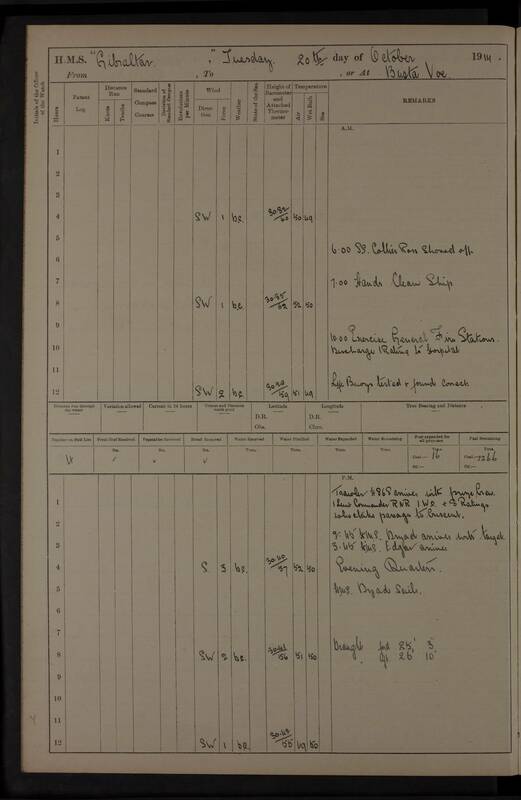 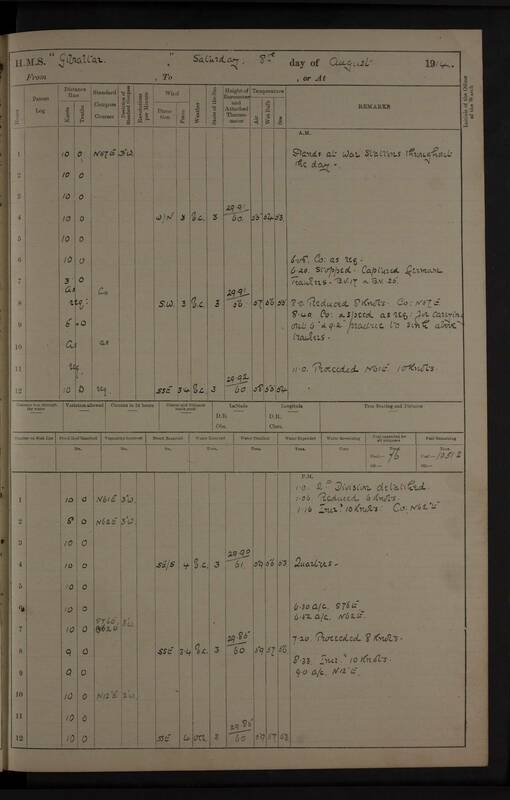 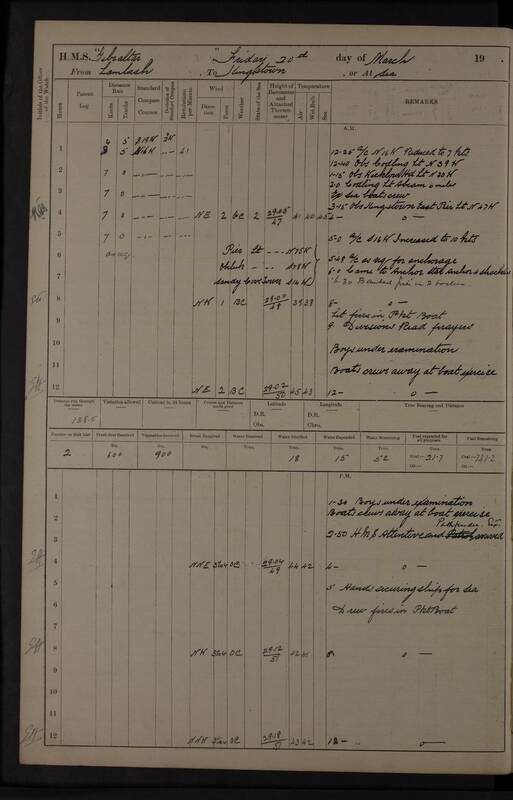 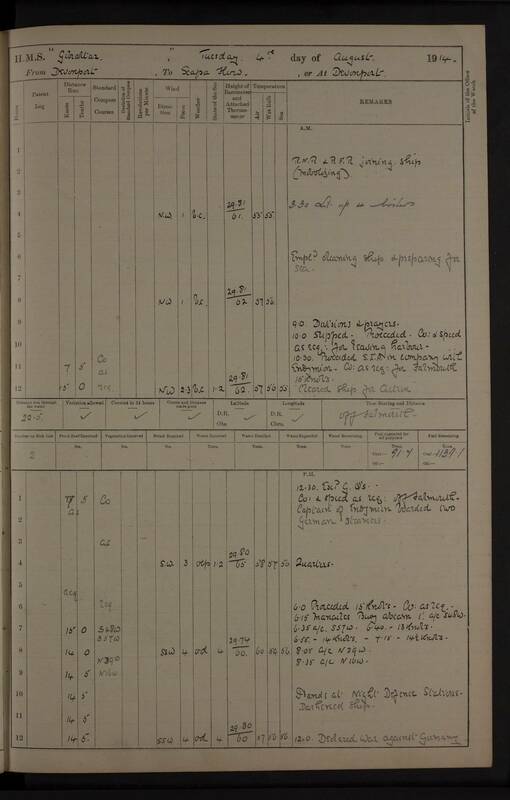 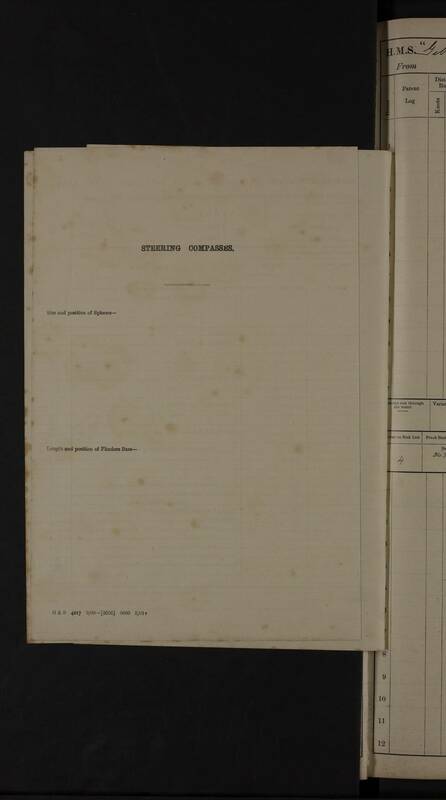 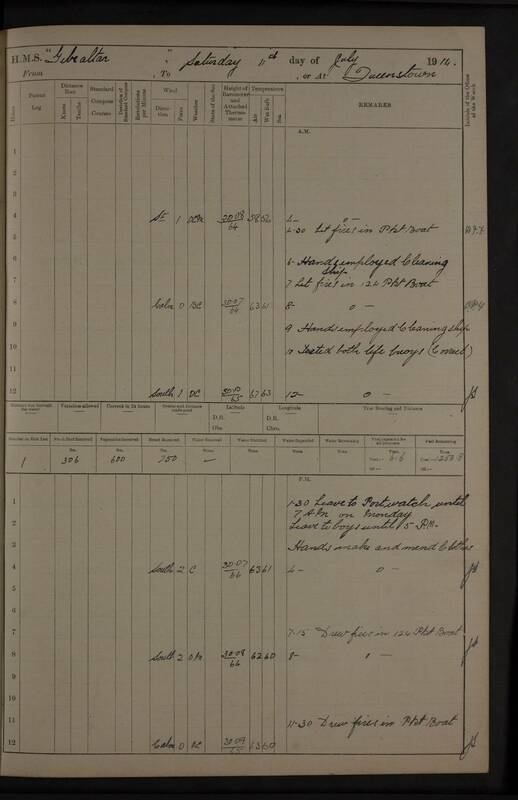 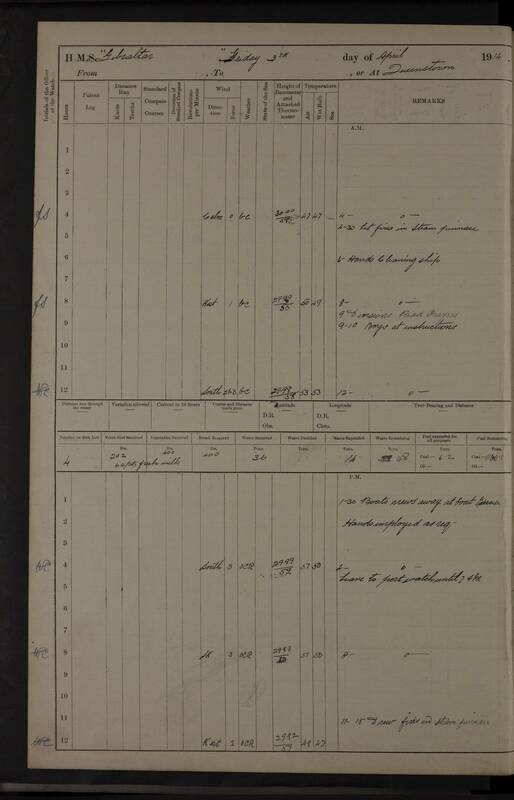 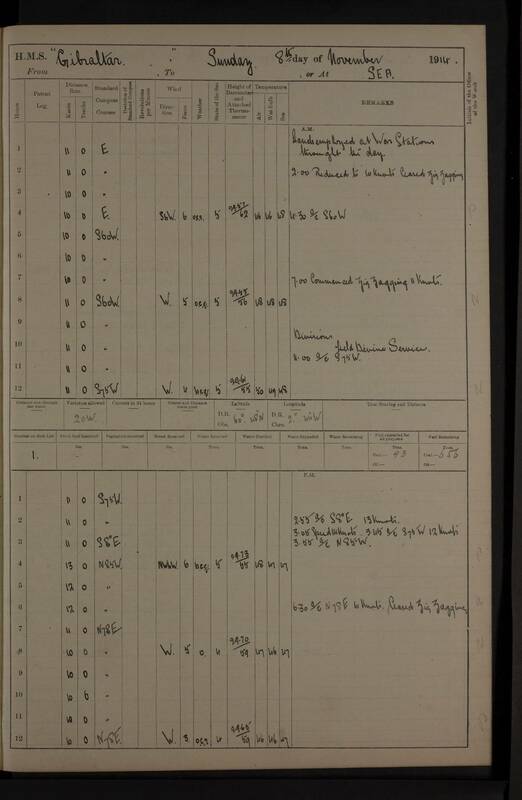 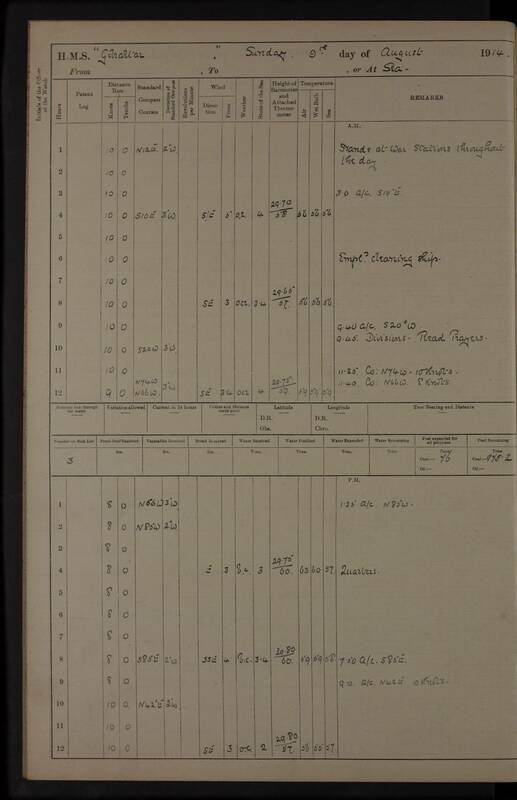 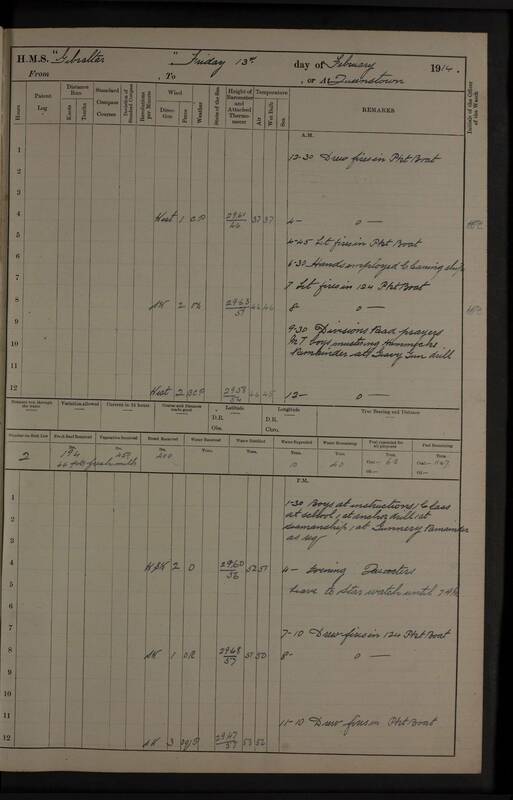 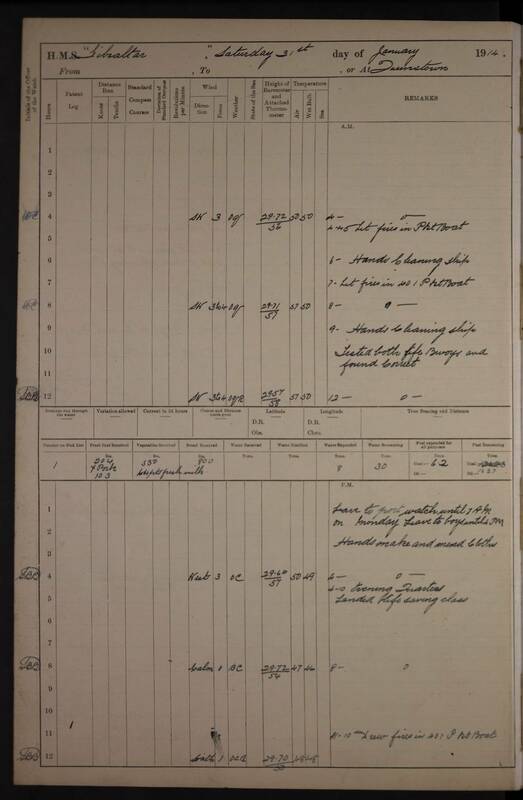 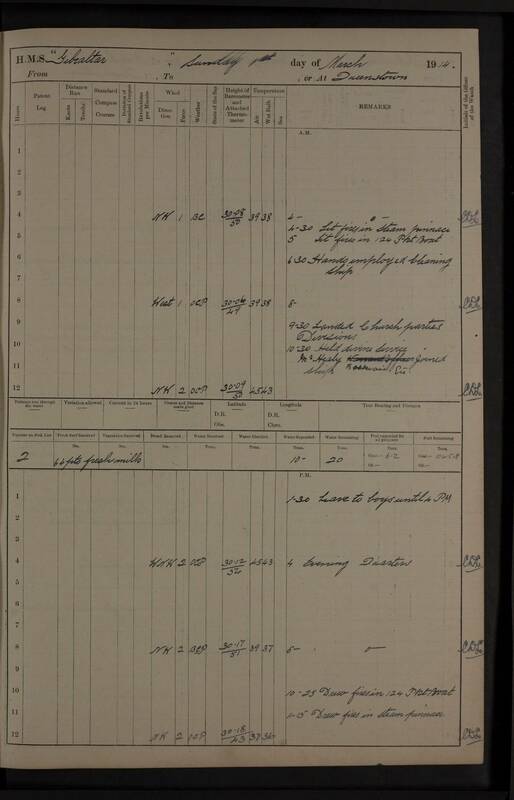 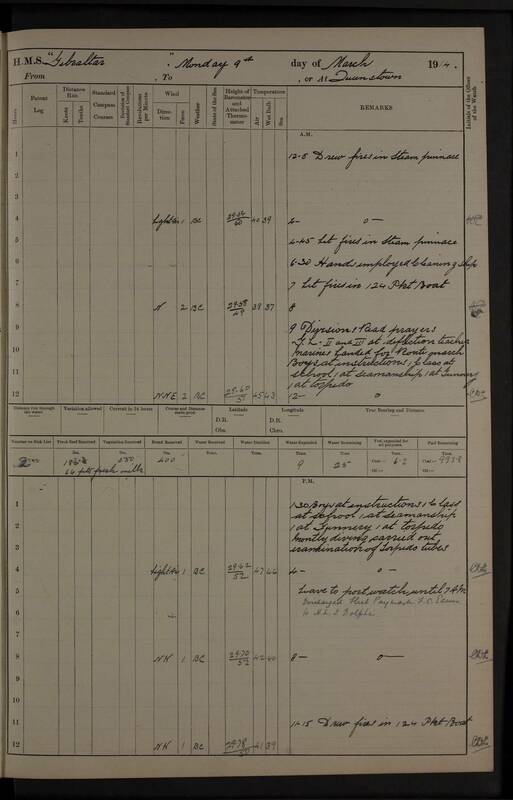 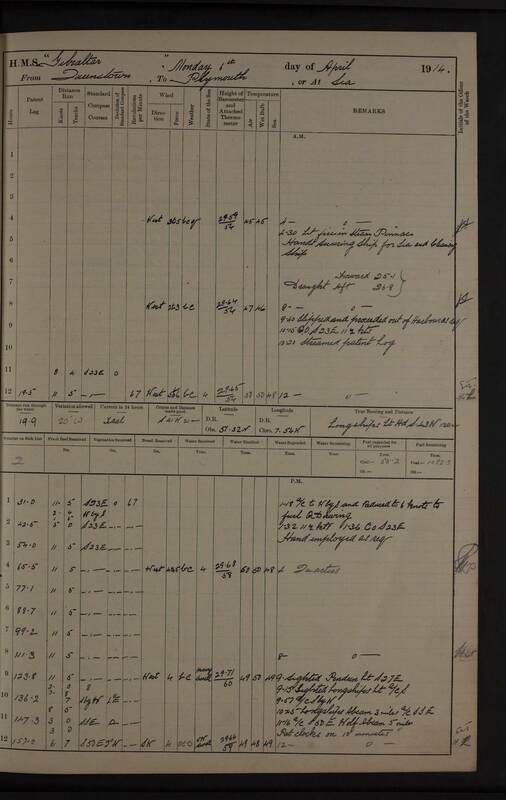 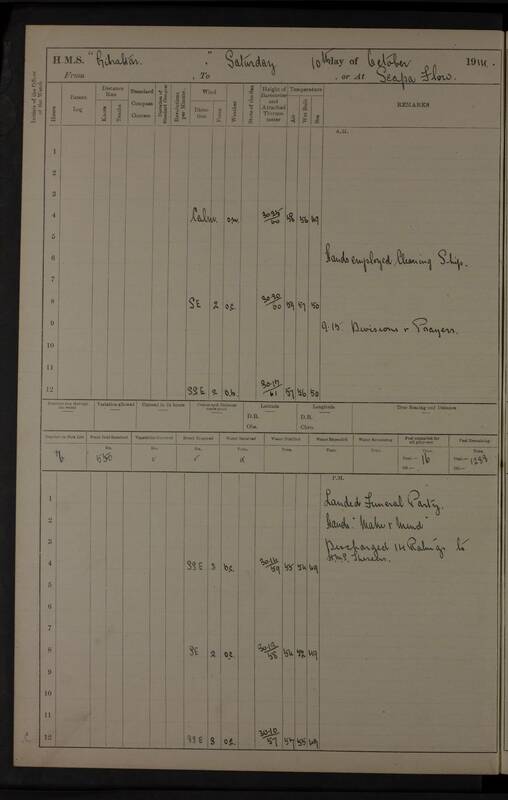 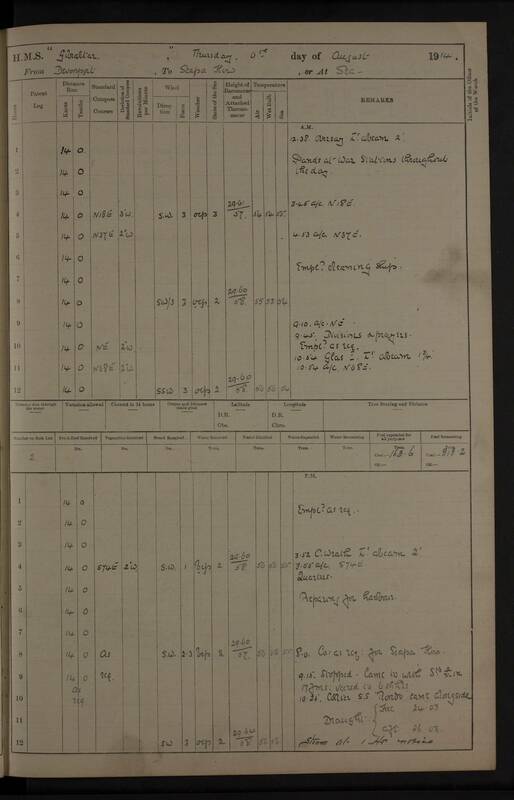 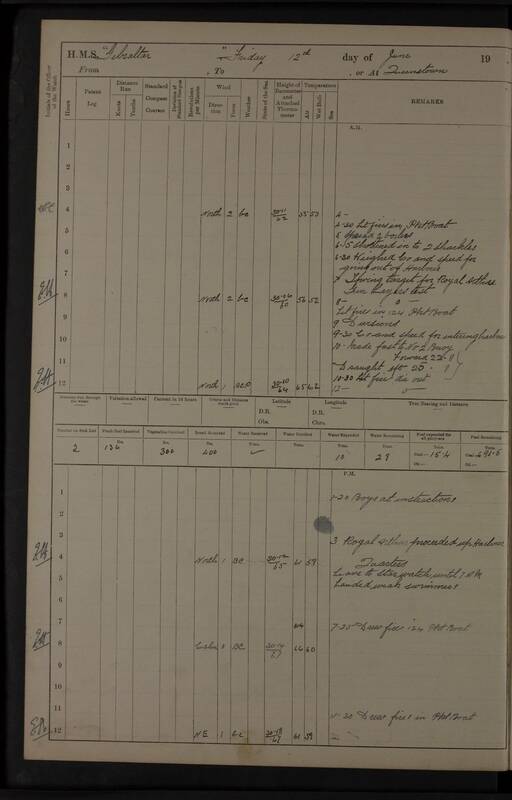 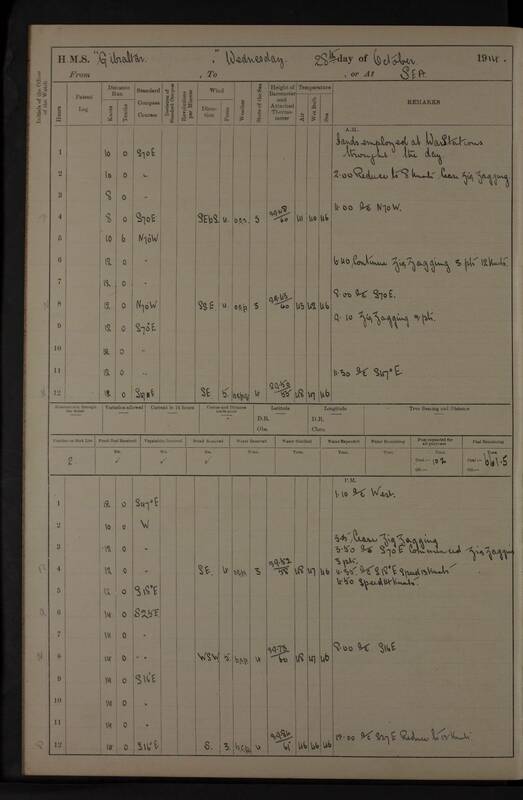 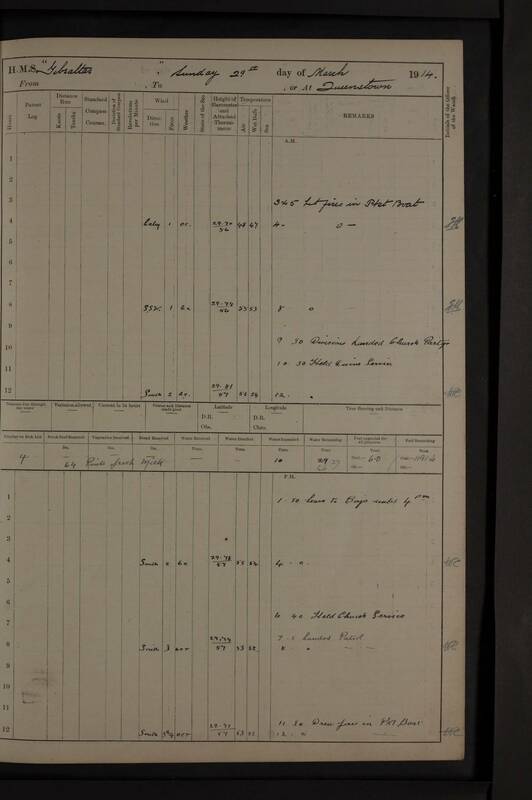 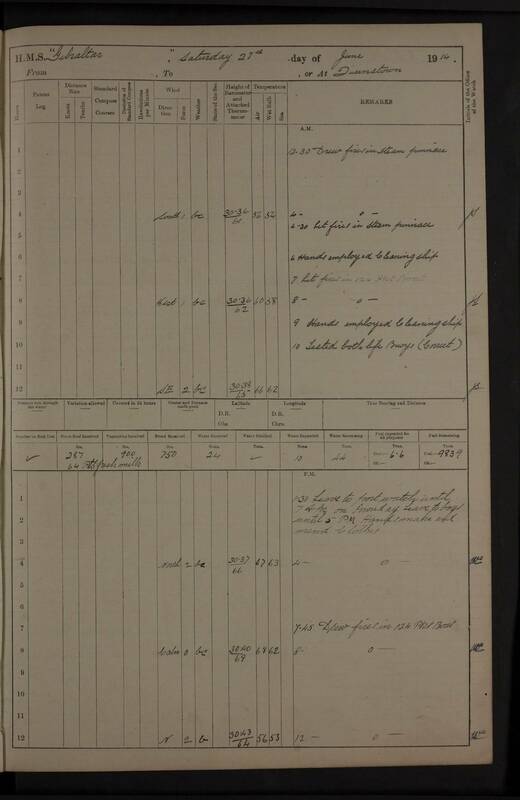 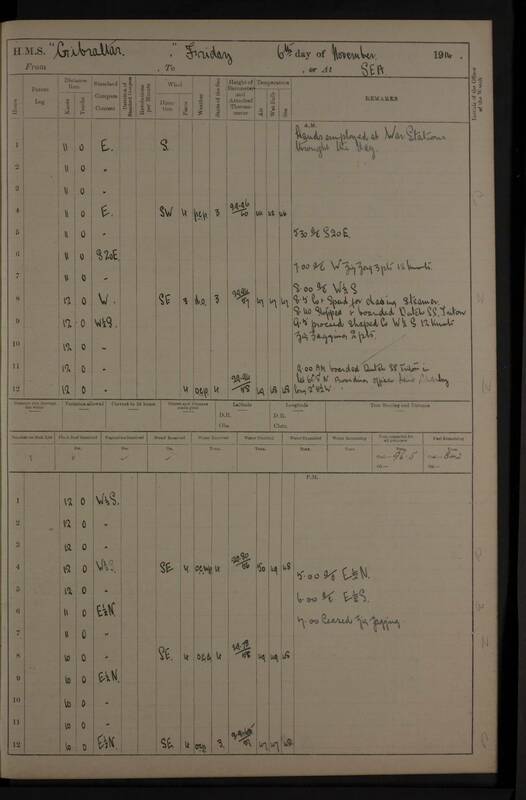 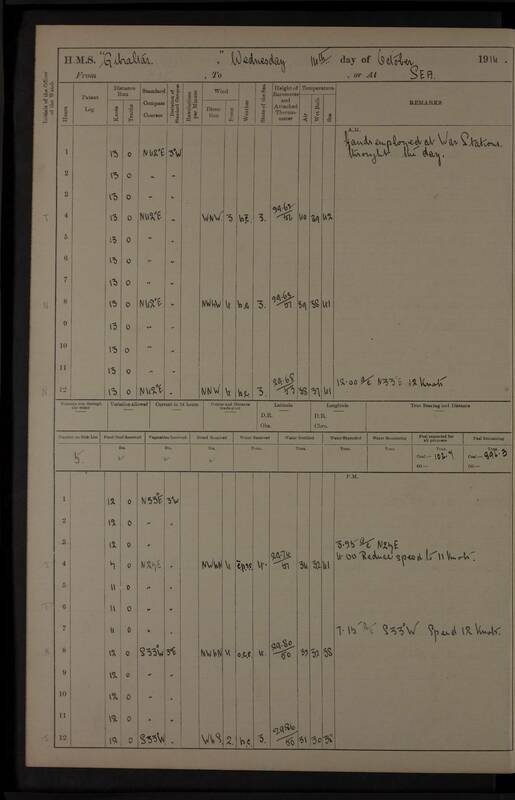 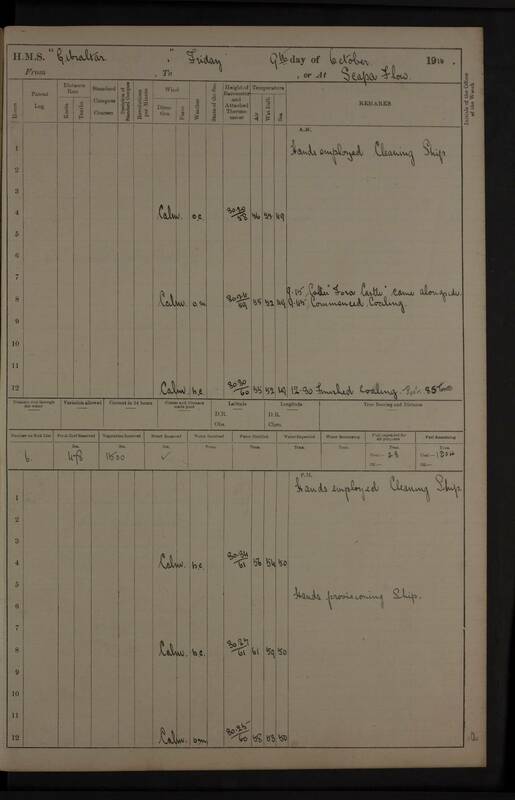 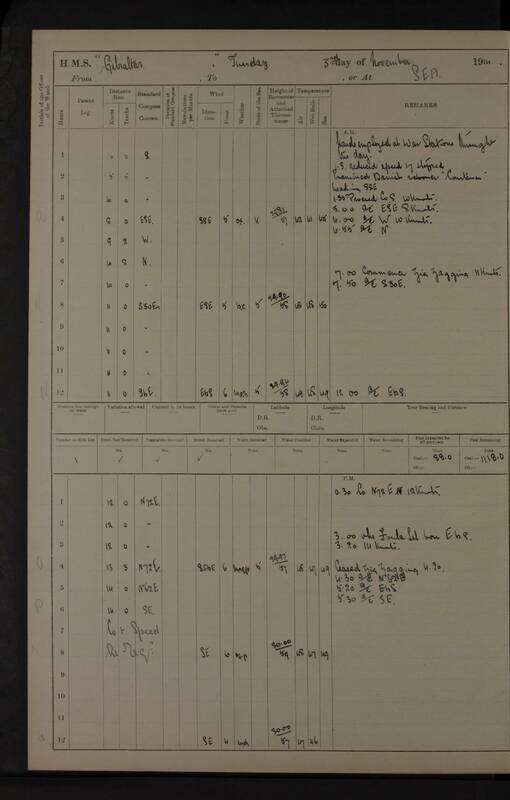 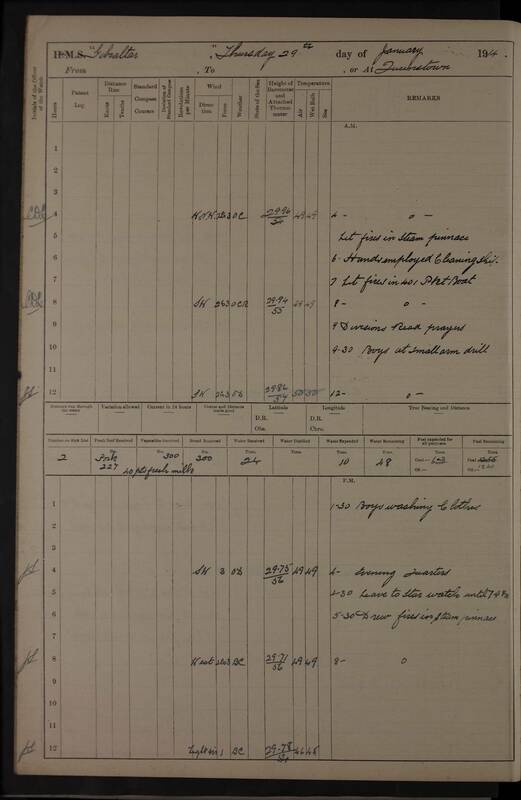 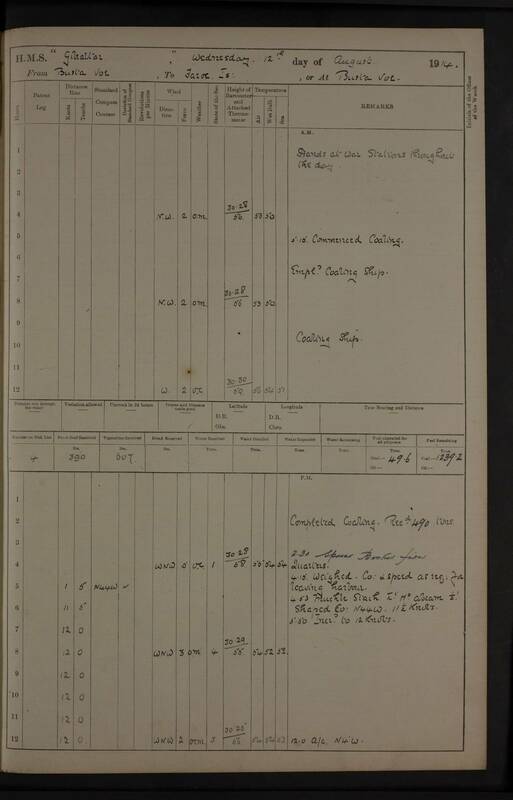 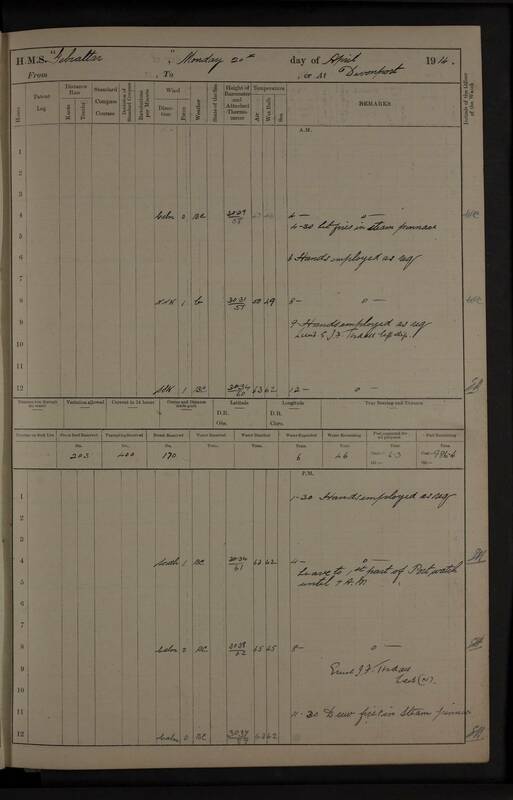 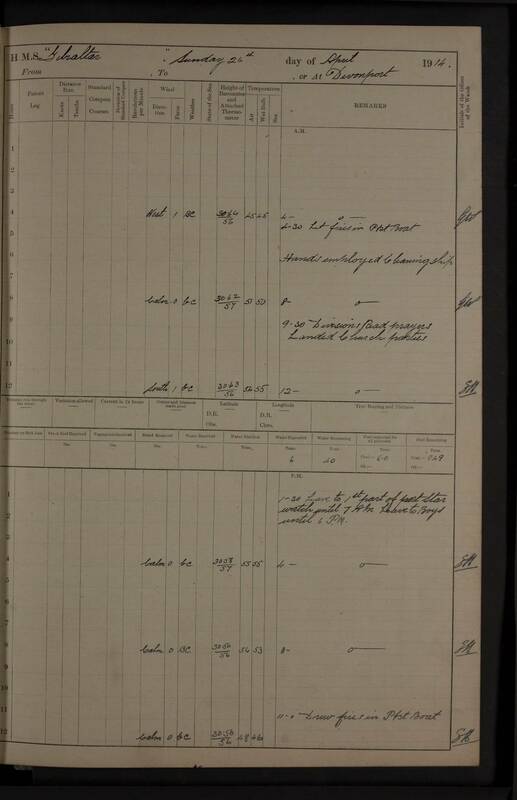 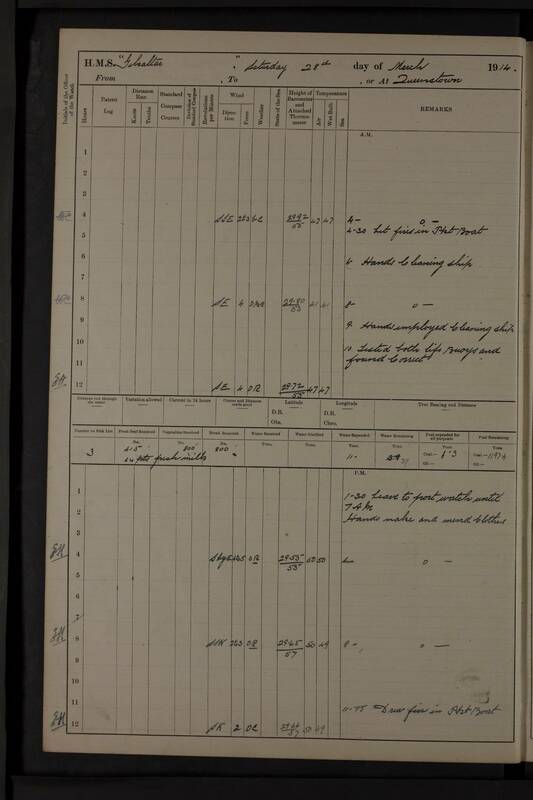 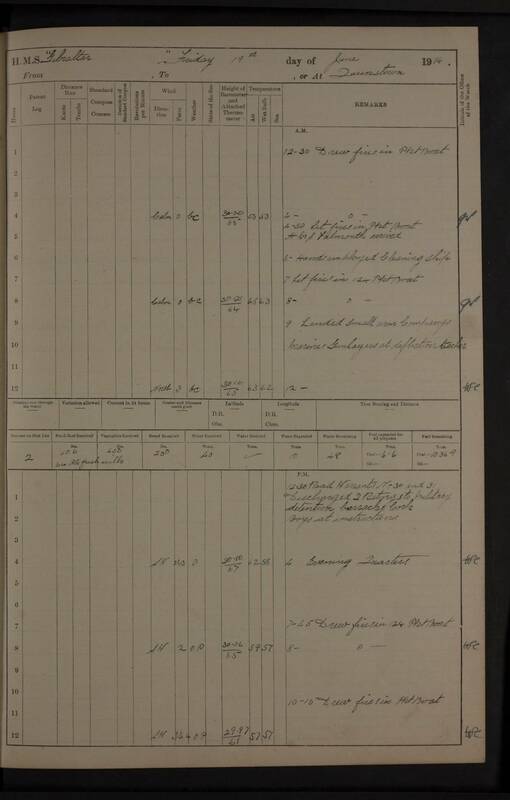 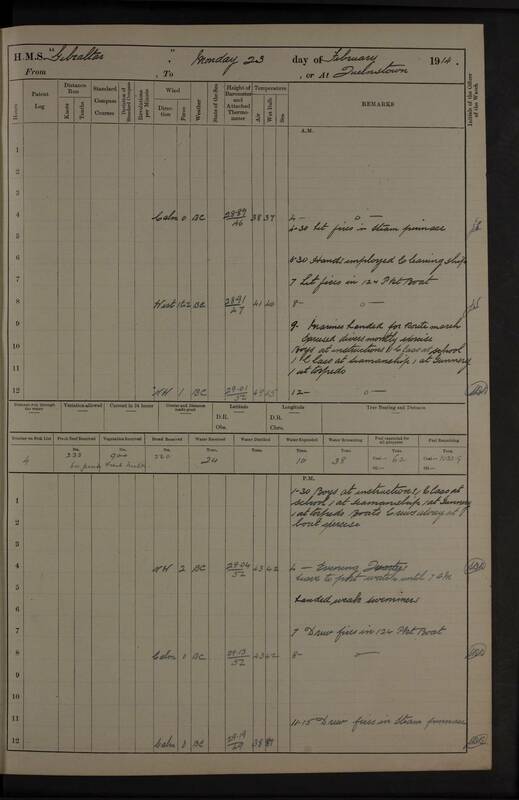 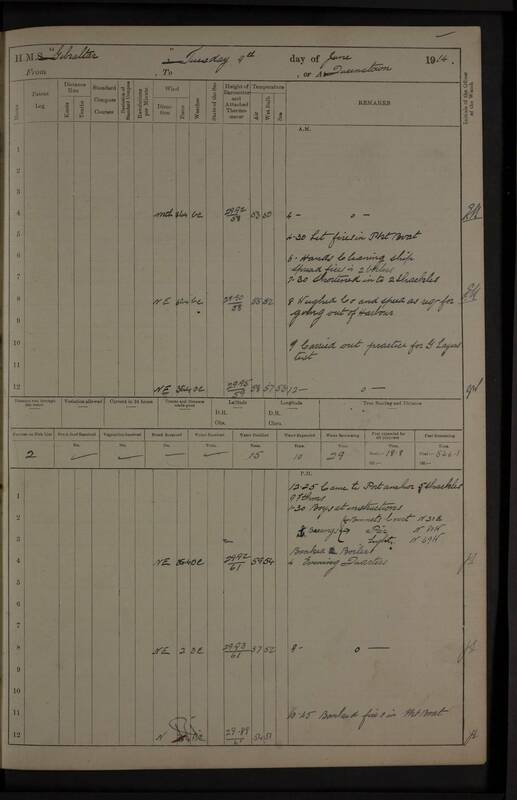 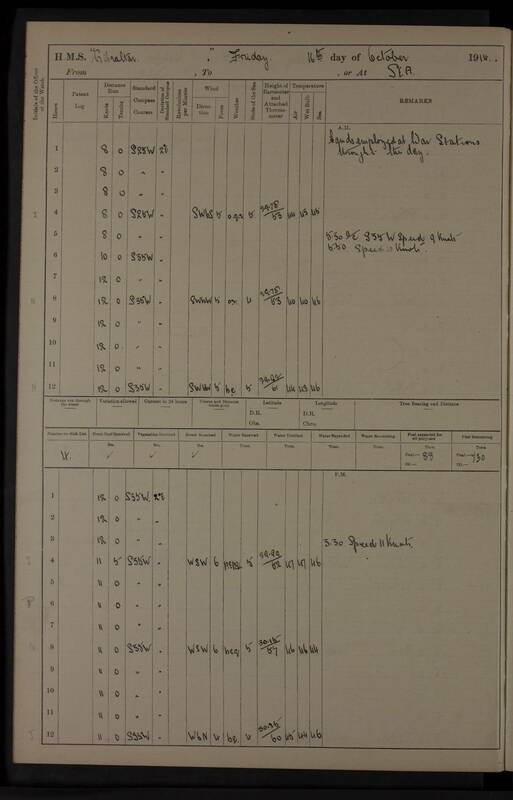 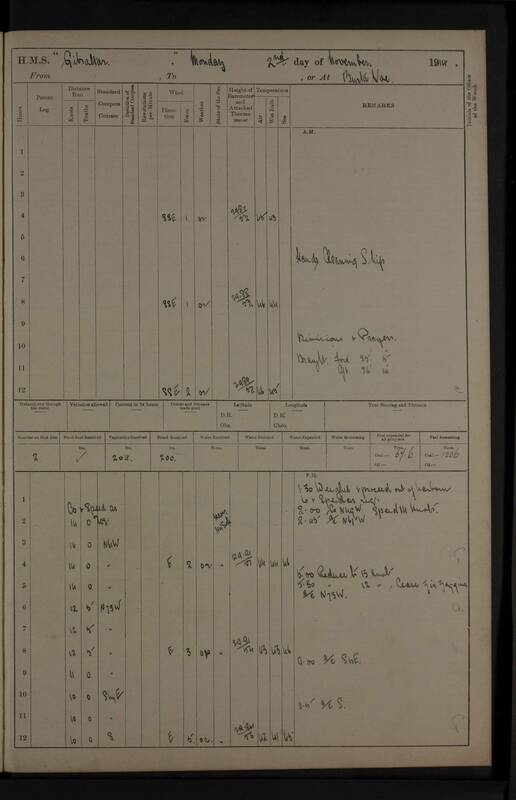 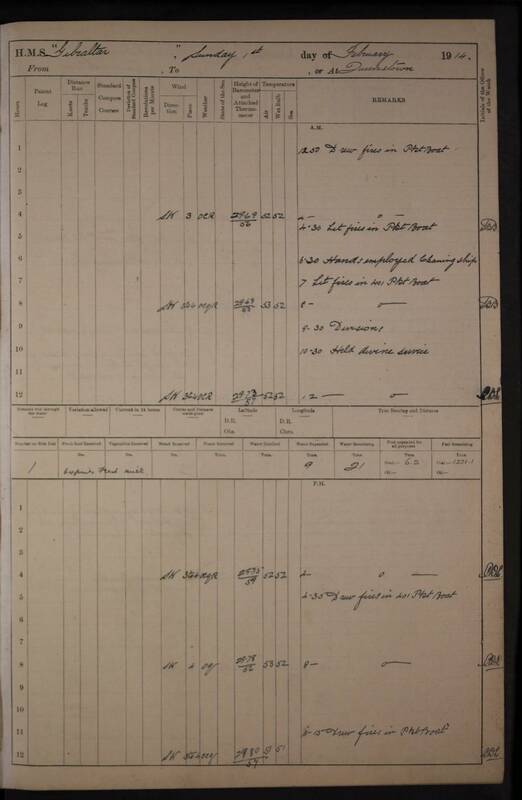 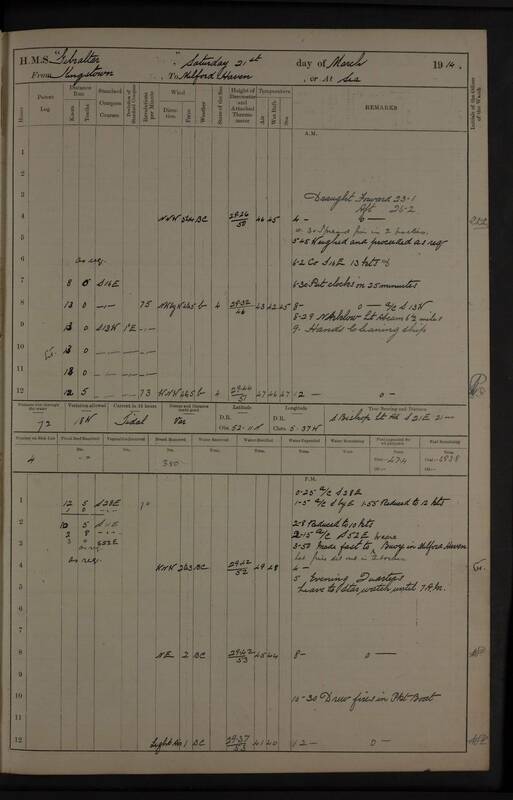 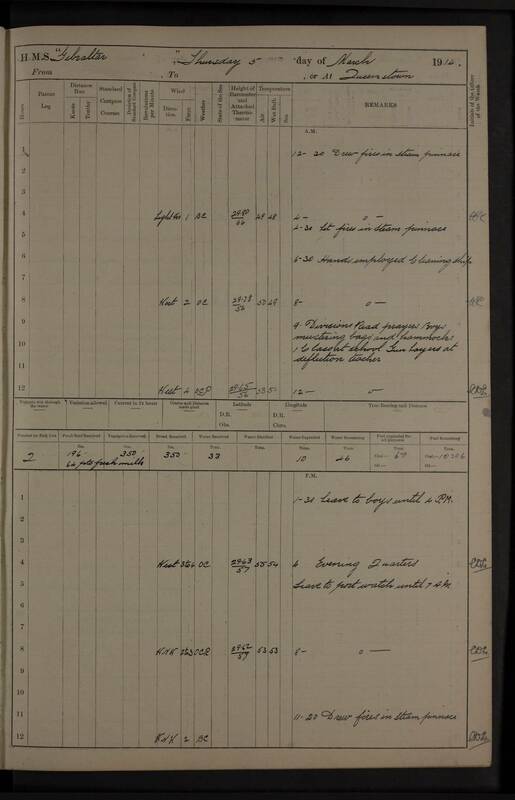 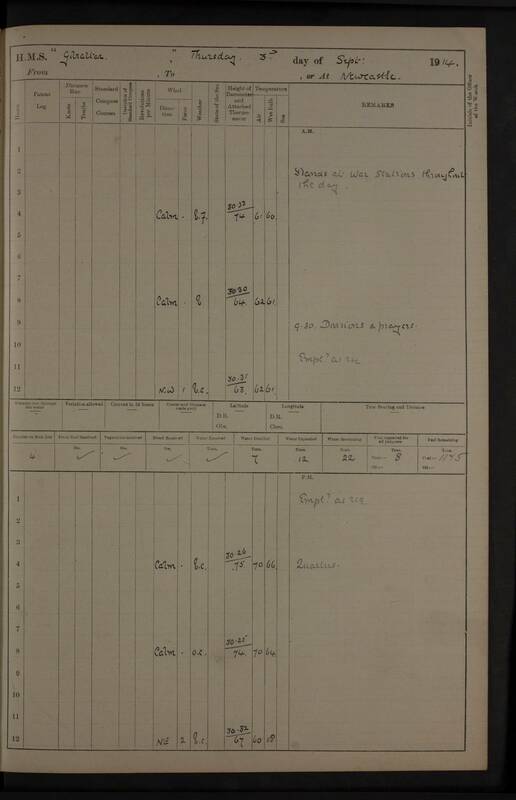 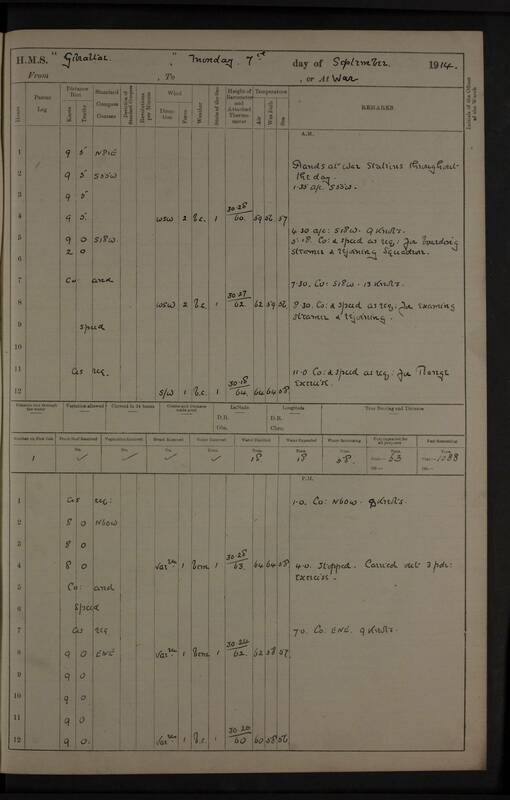 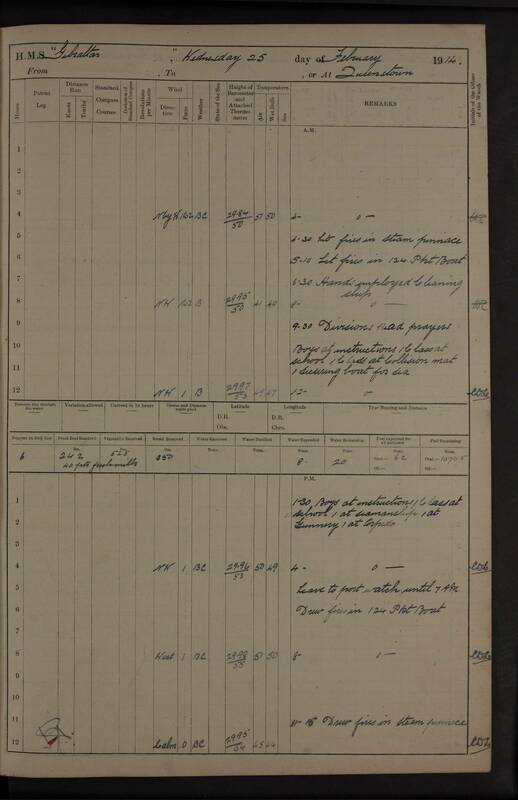 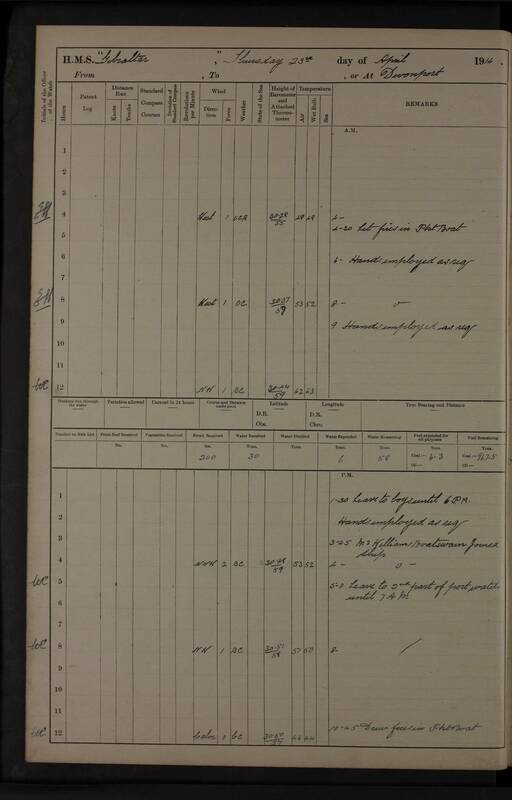 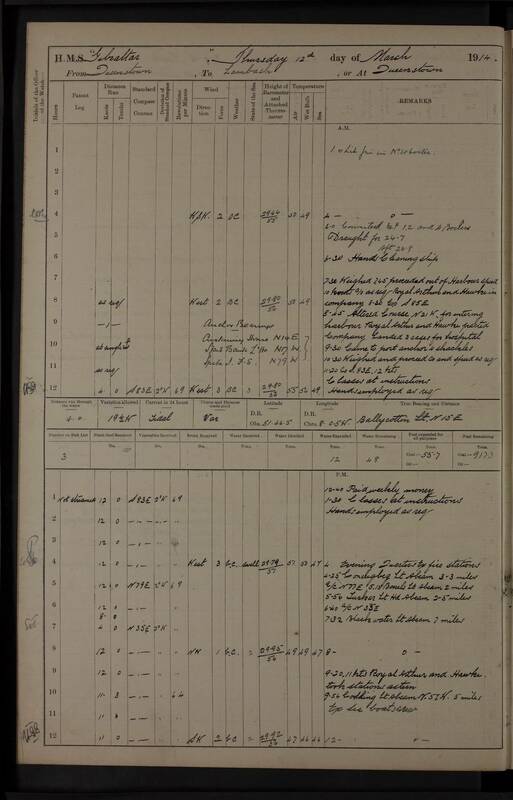 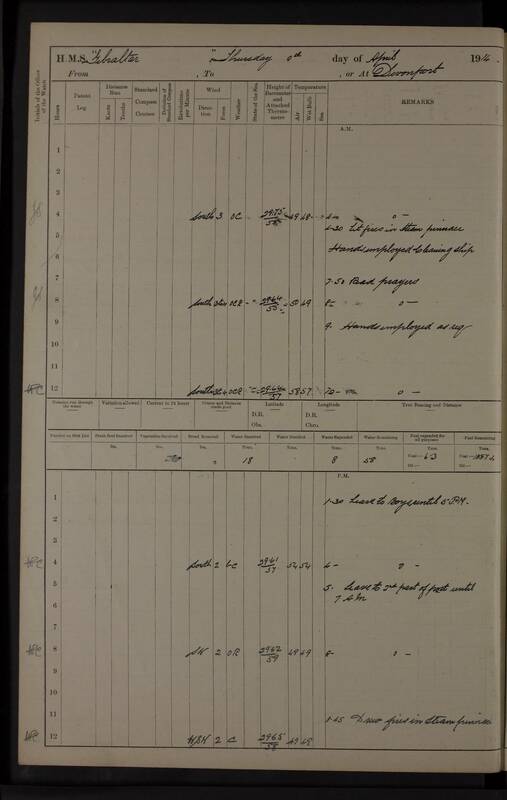 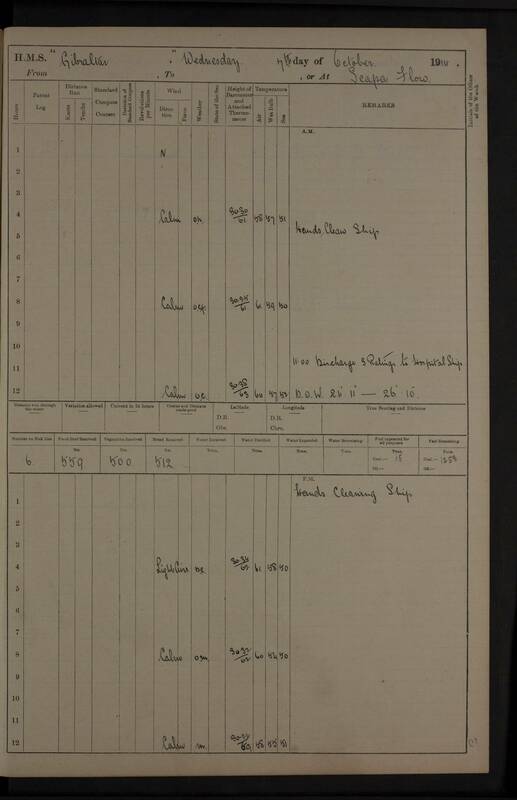 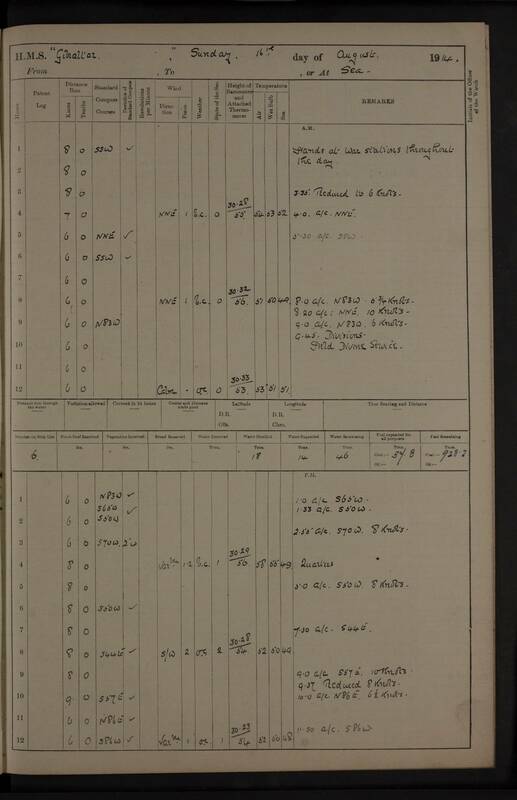 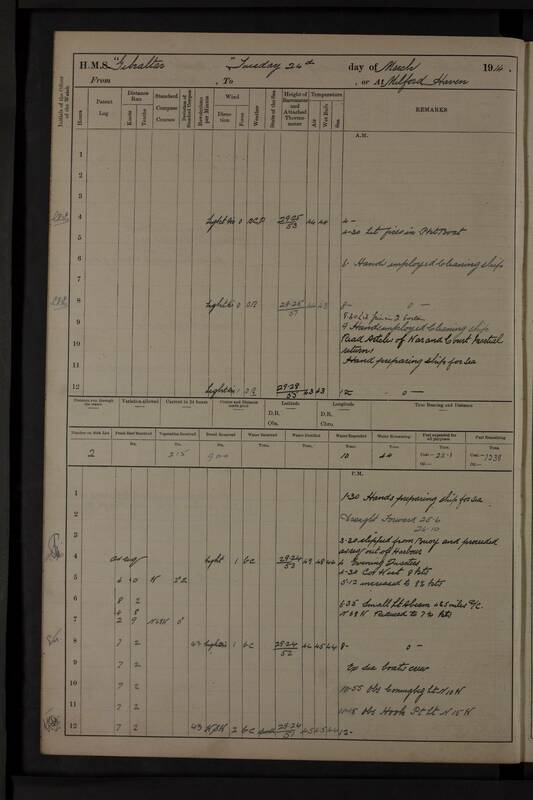 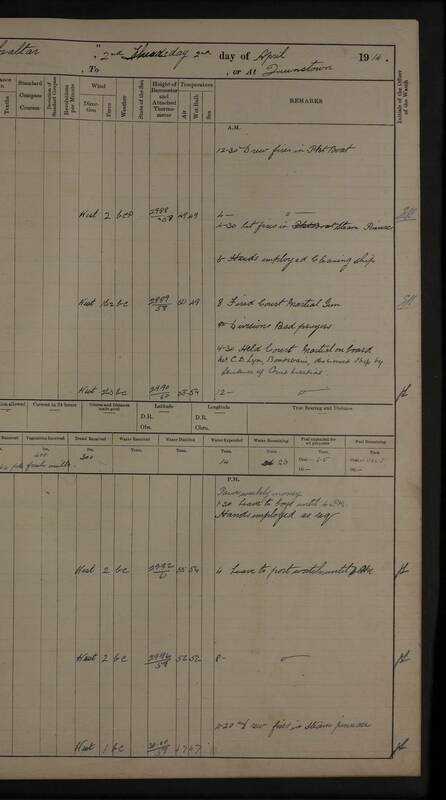 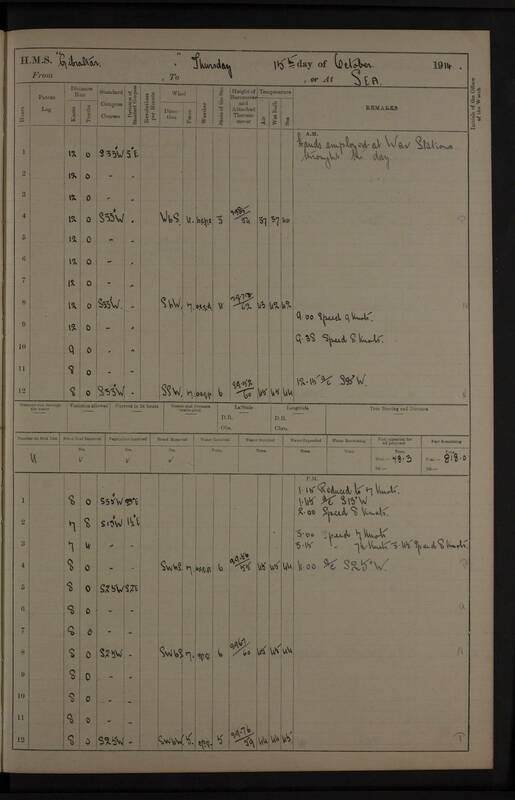 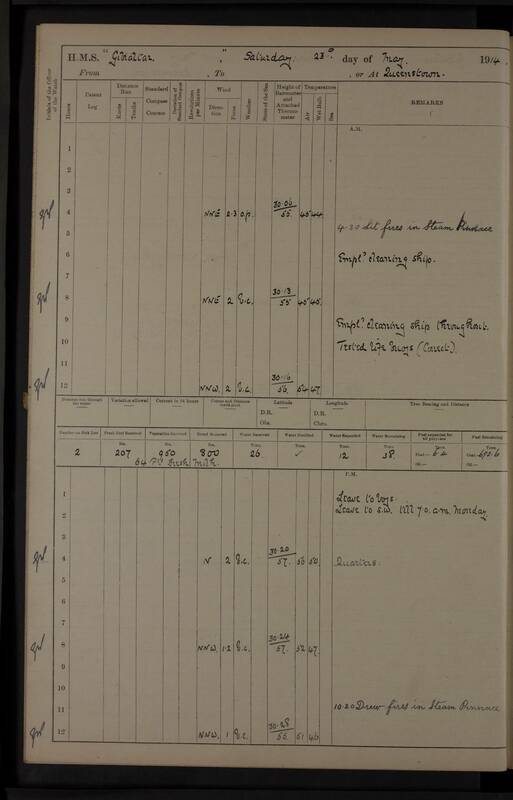 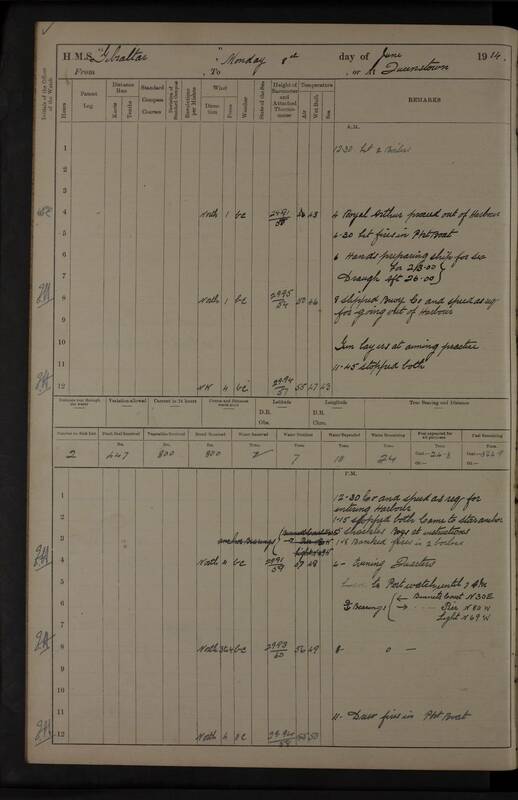 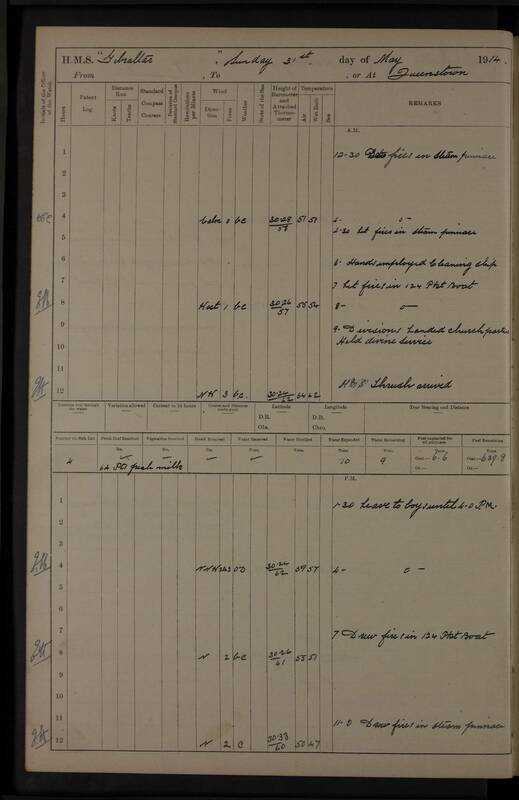 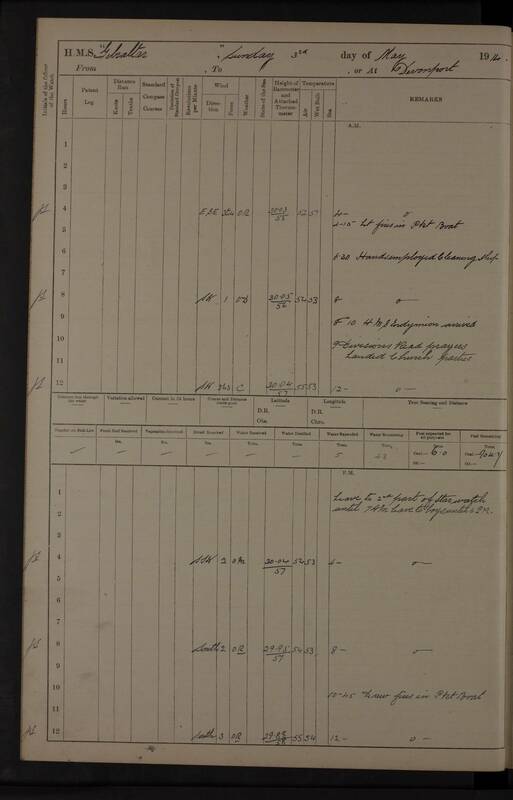 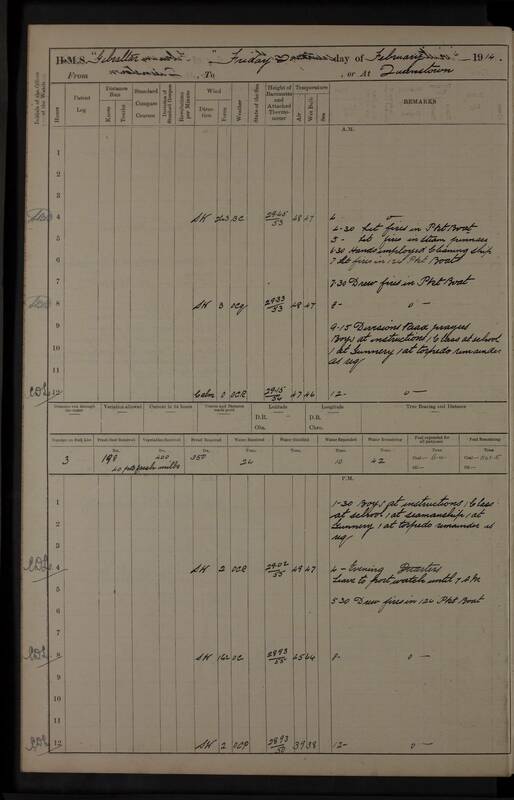 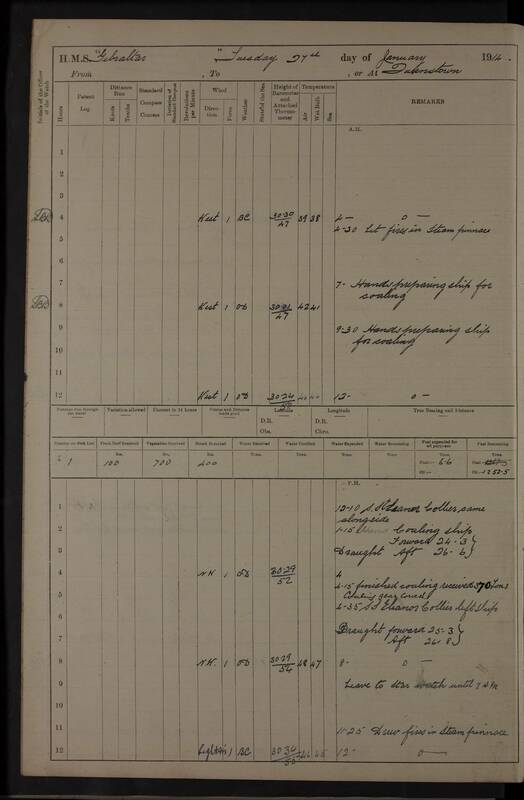 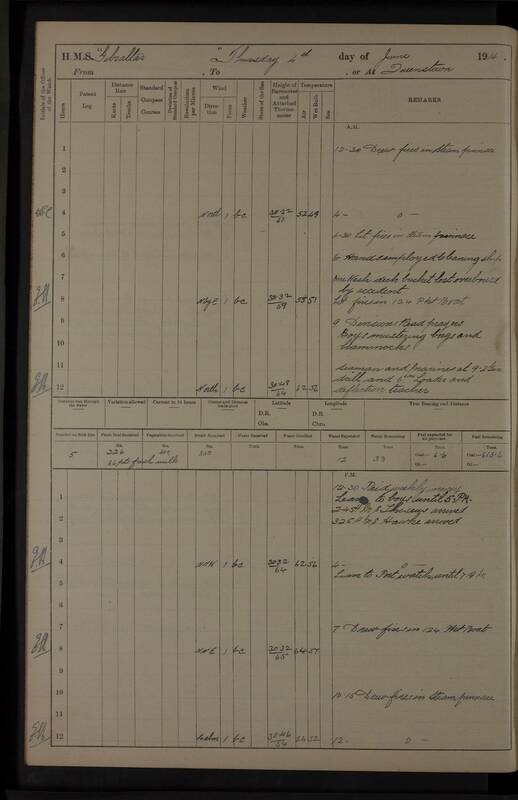 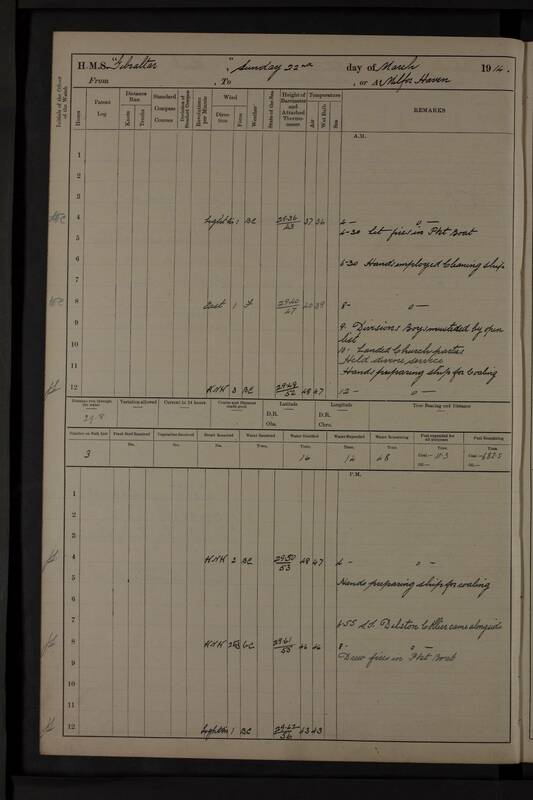 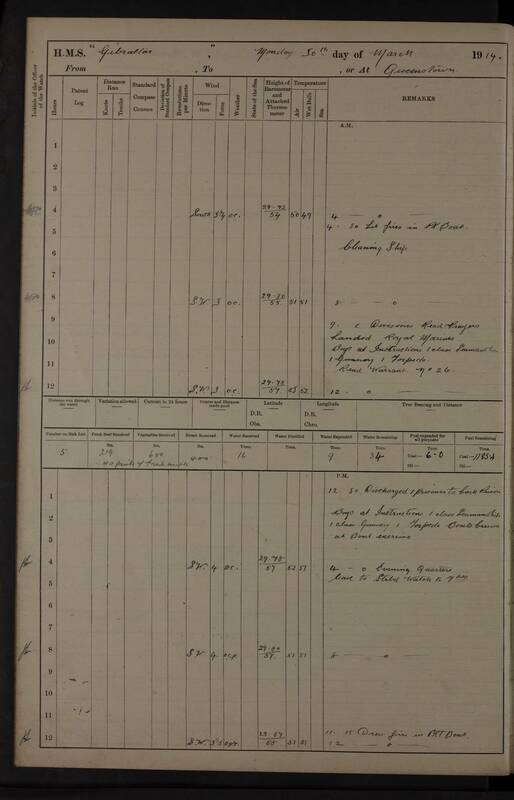 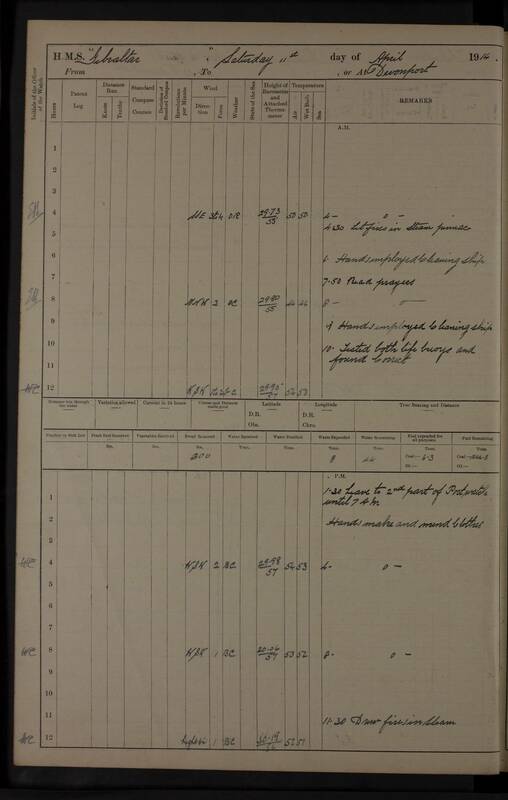 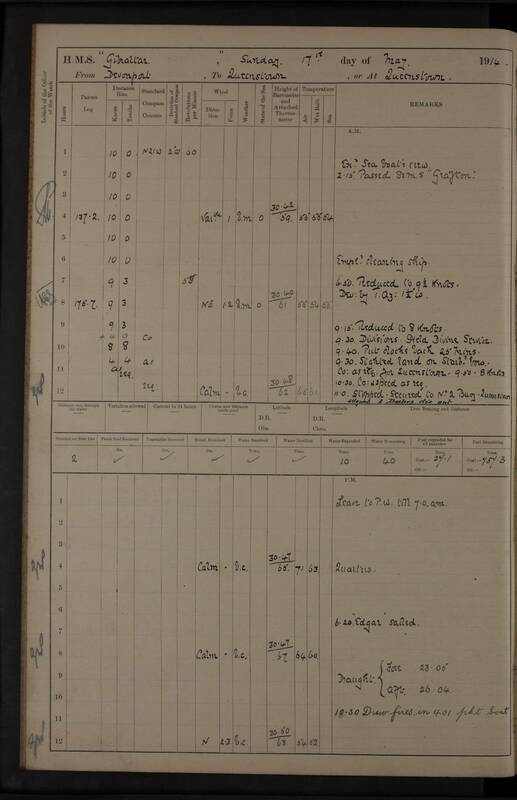 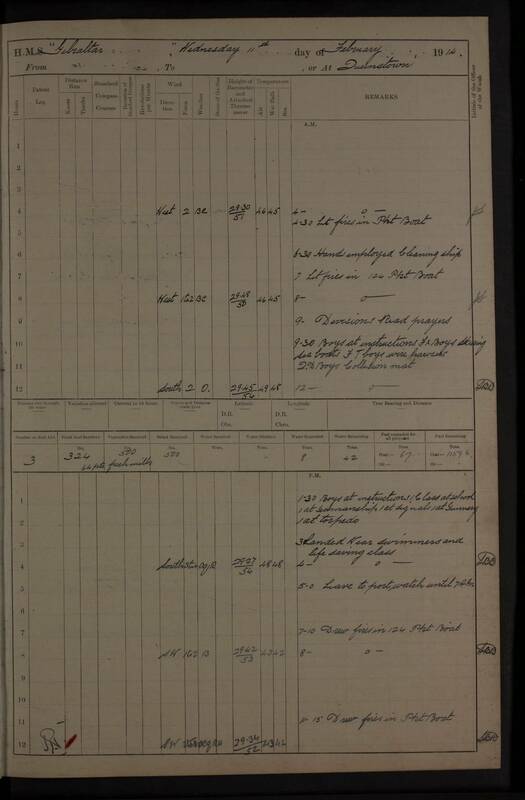 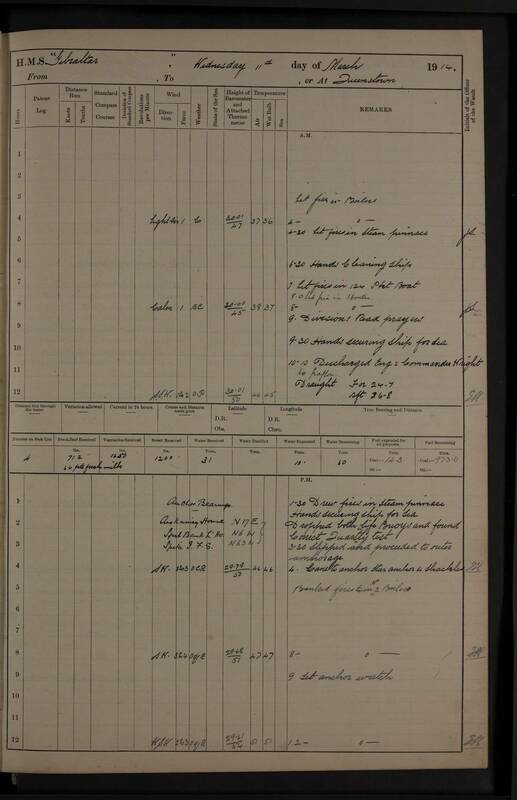 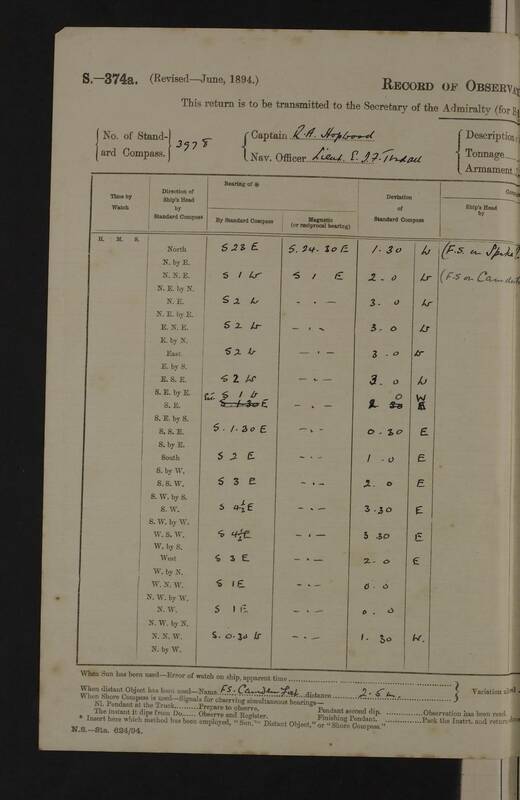 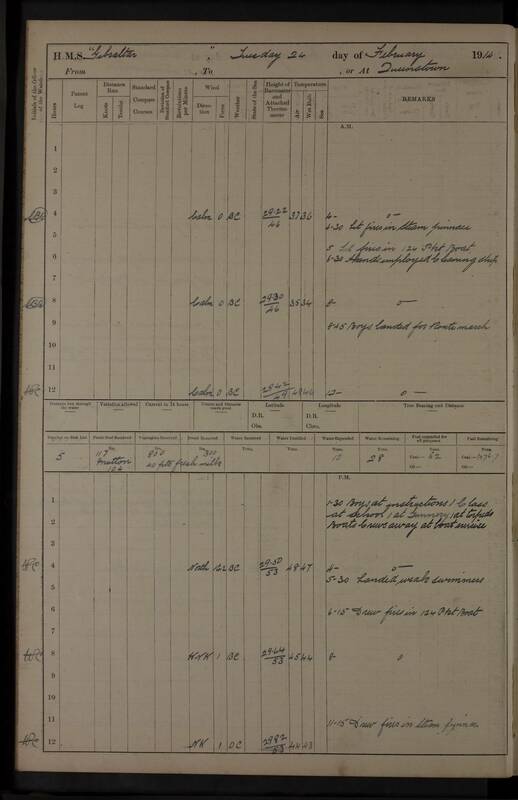 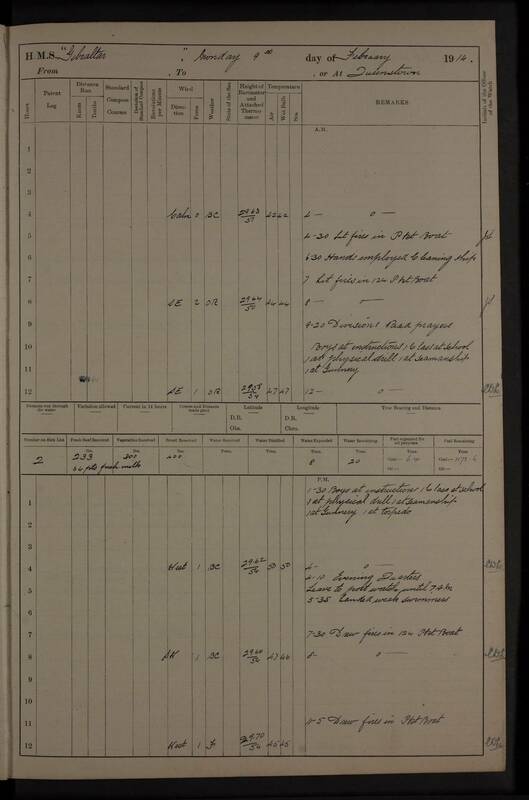 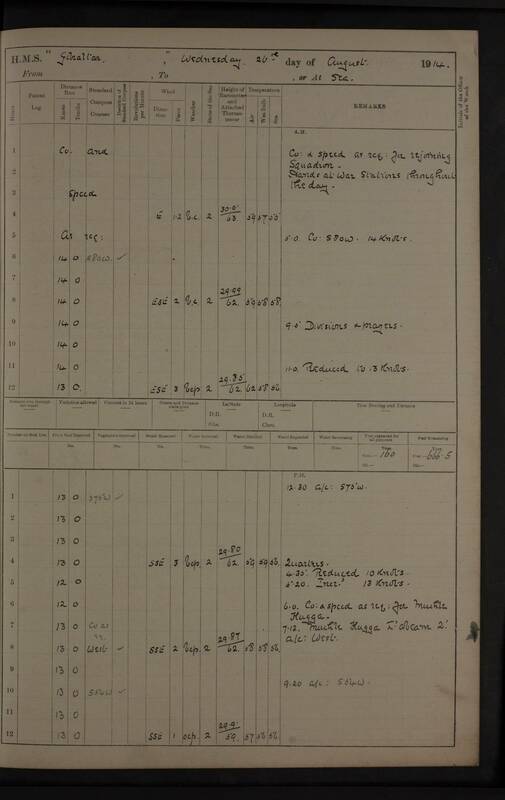 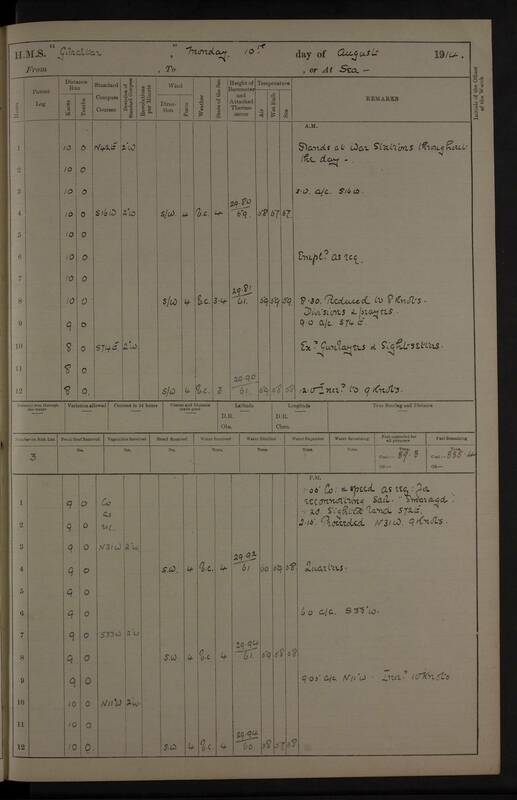 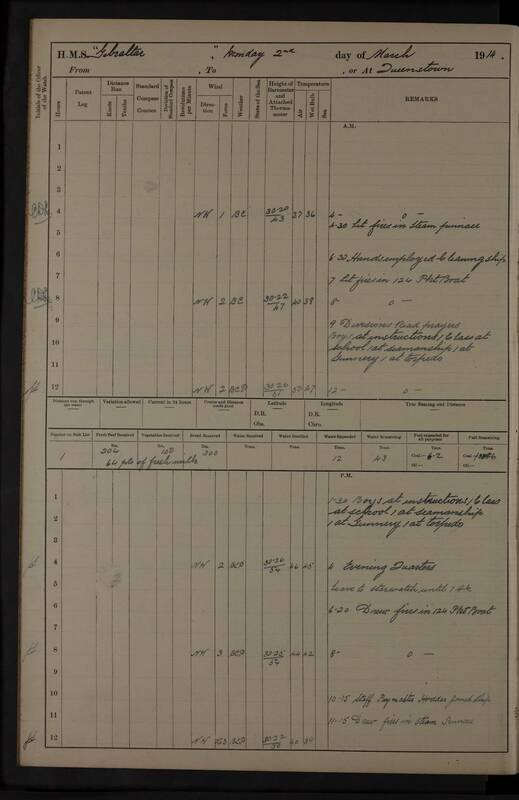 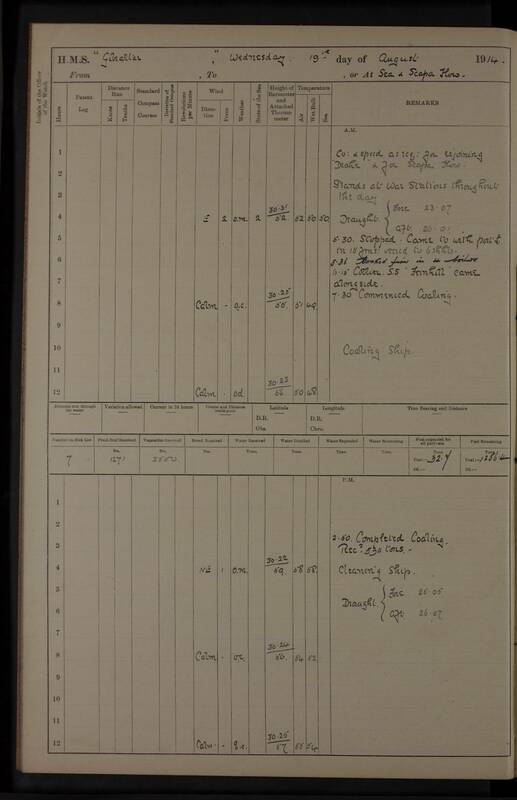 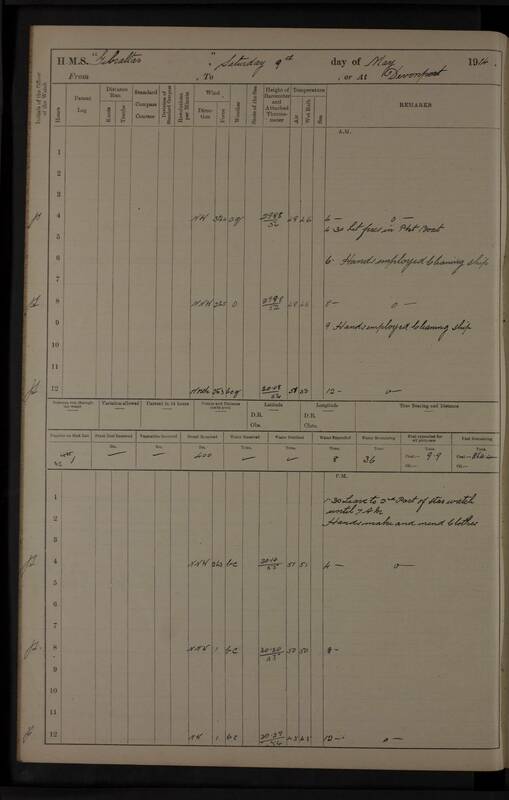 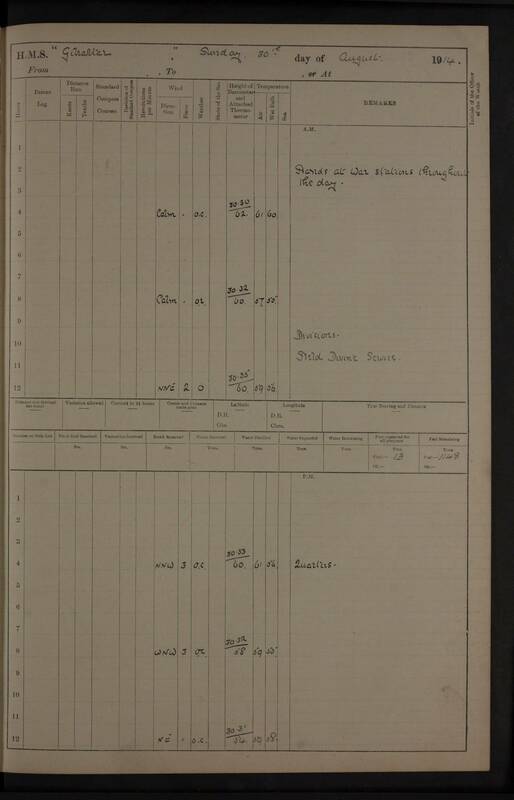 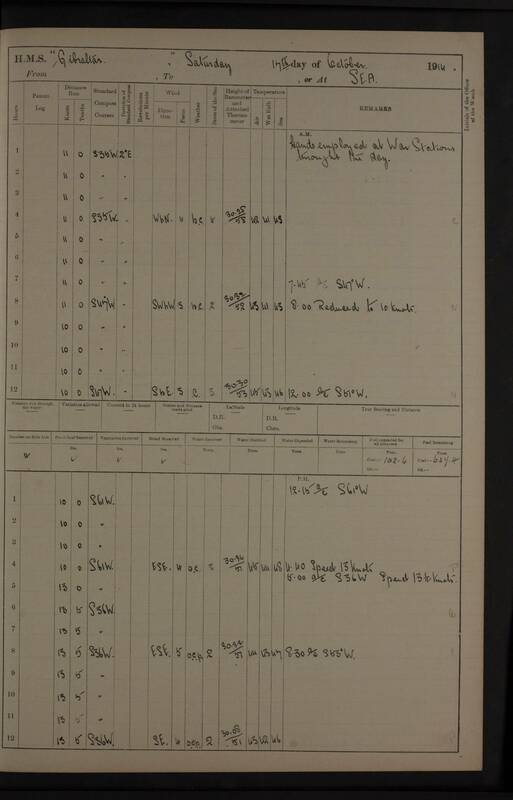 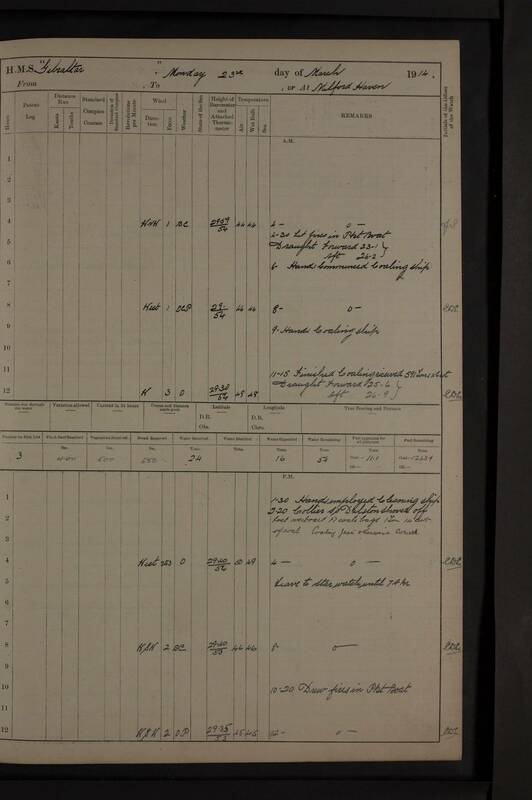 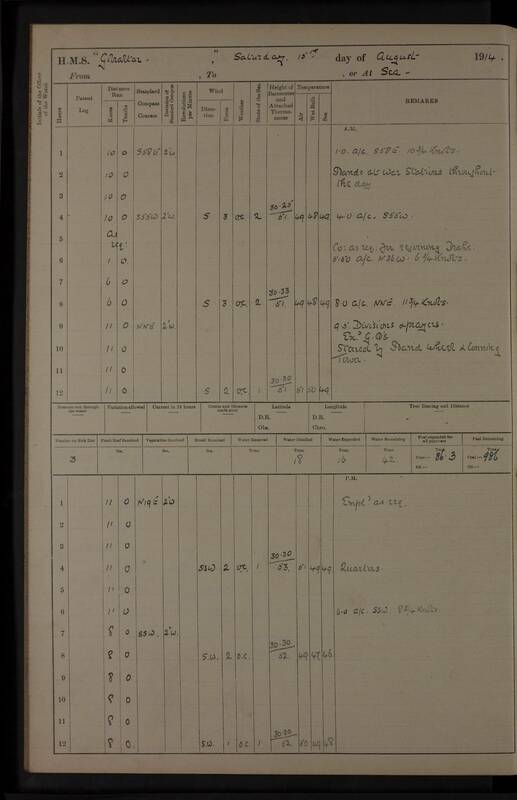 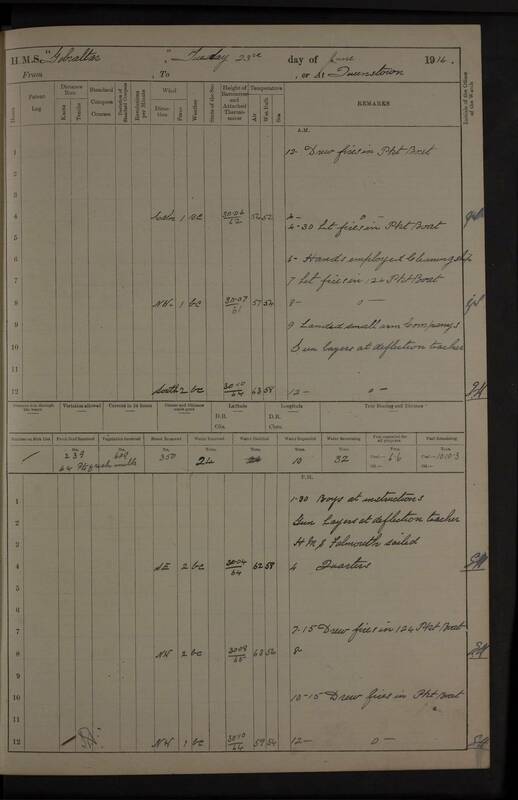 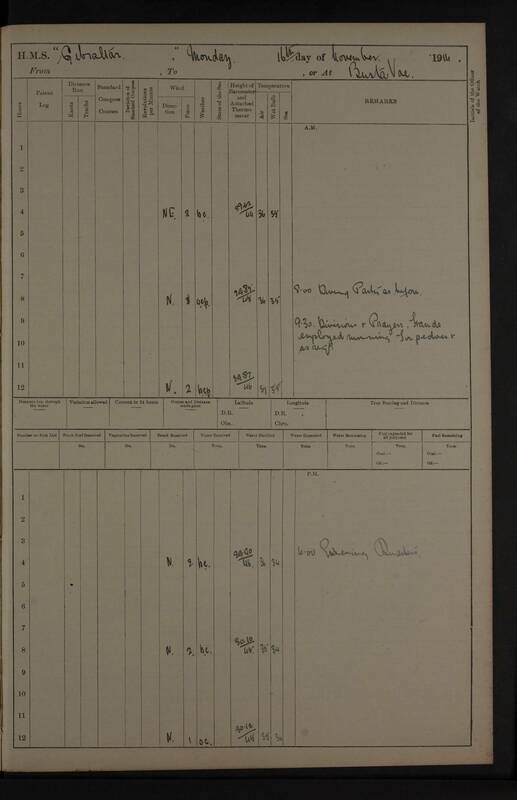 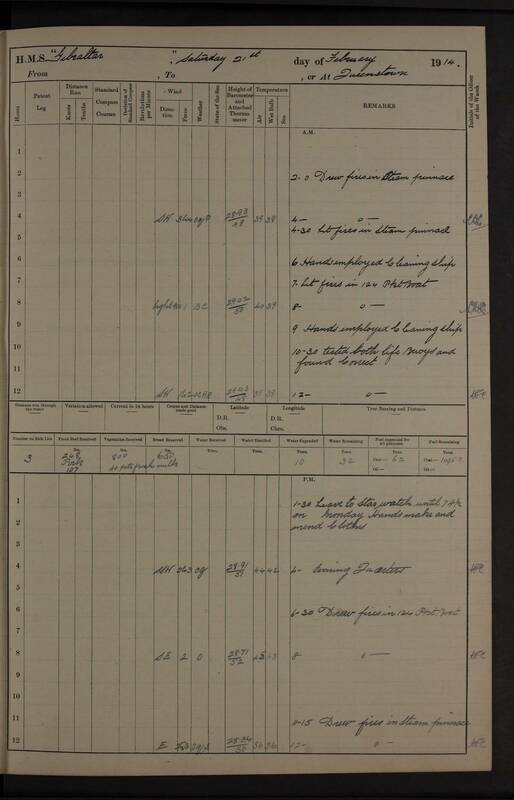 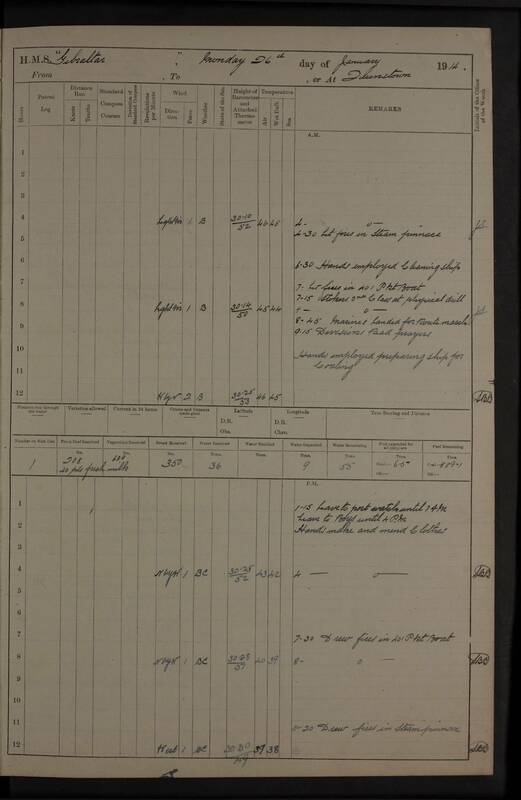 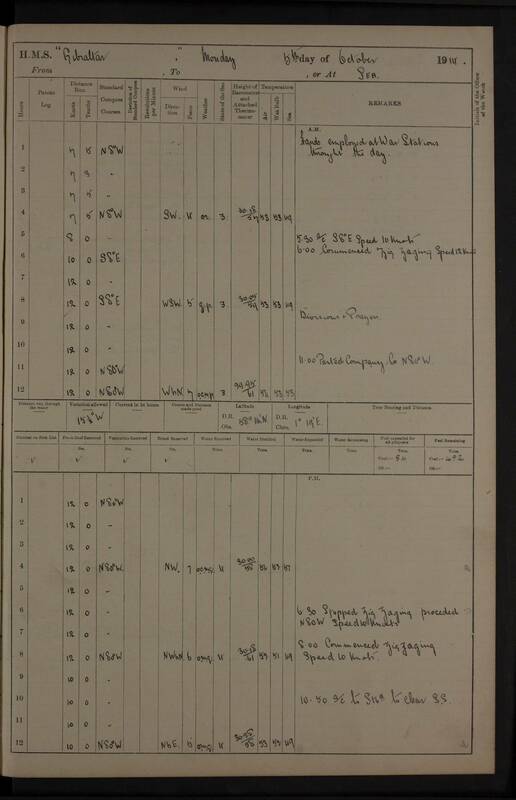 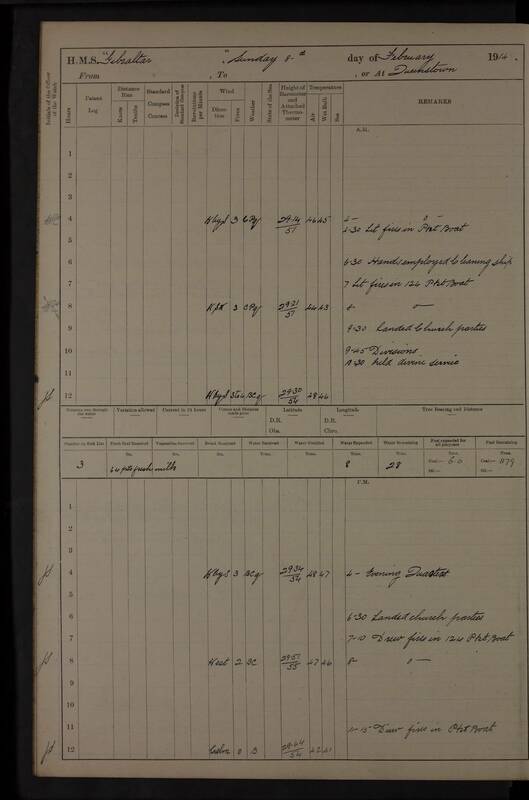 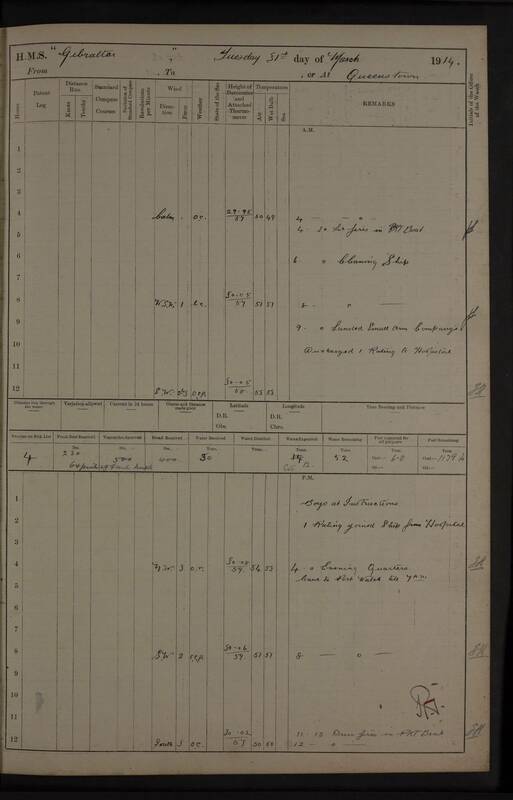 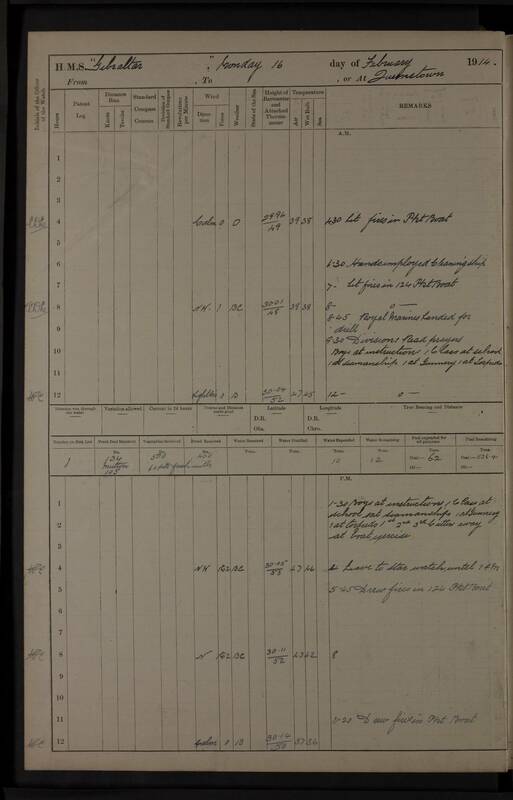 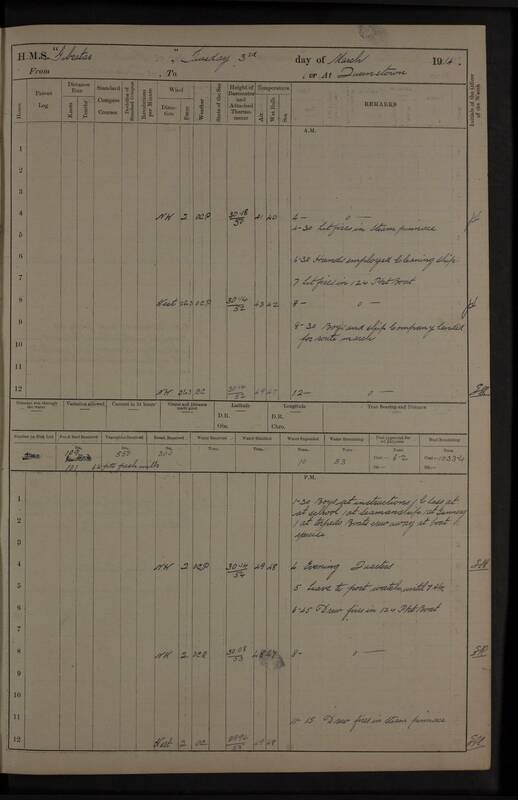 pm: Discharged 61 boys & 19 Stokers 2c to R.N.B. 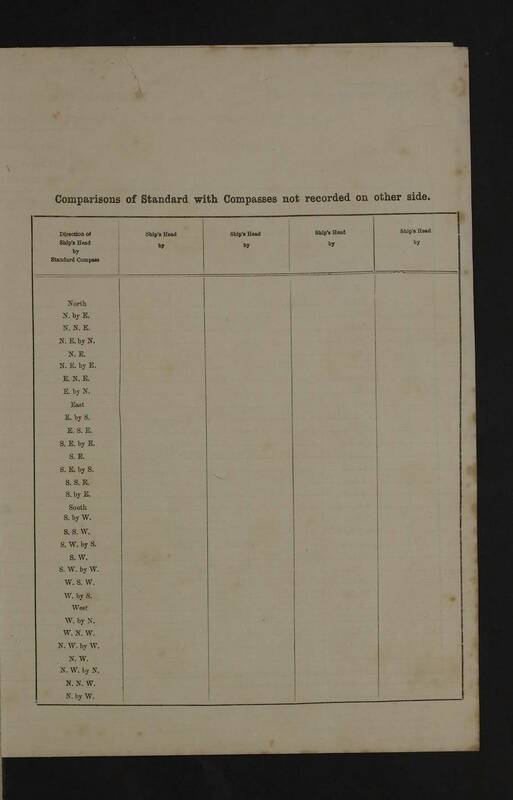 ; 9 Stoker Ratings from R.N.B. 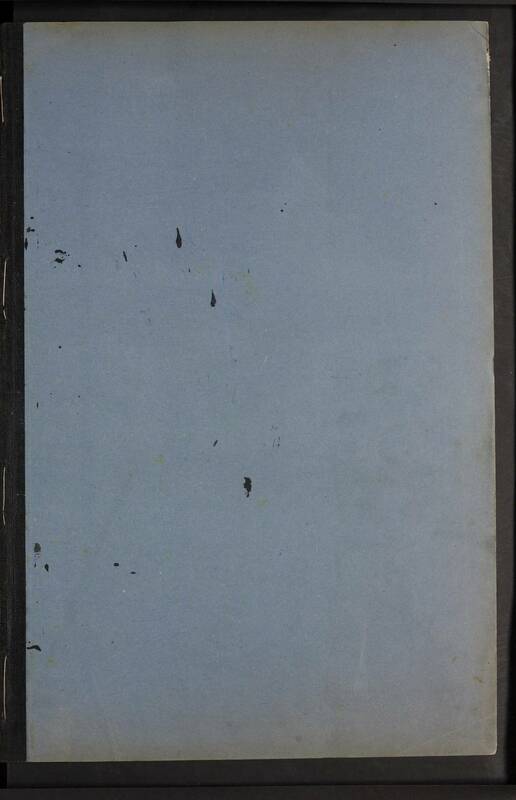 ; 1 P.O. 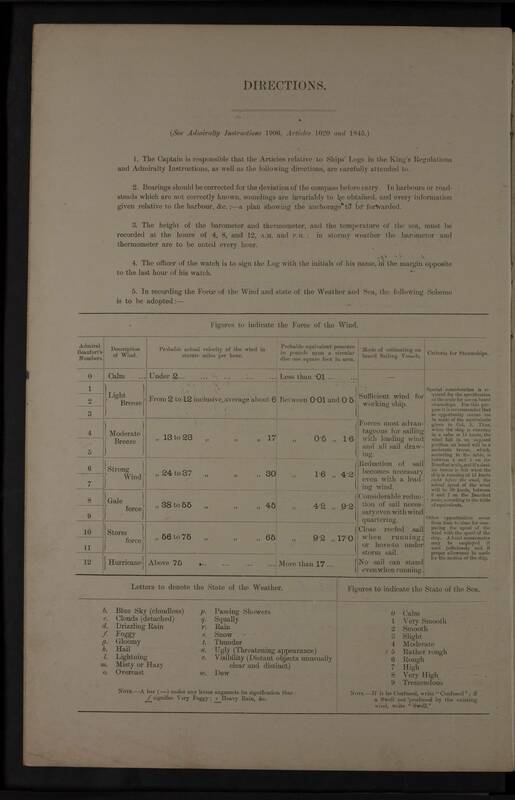 Telegraph and 12 ratings joined from R.N.B. 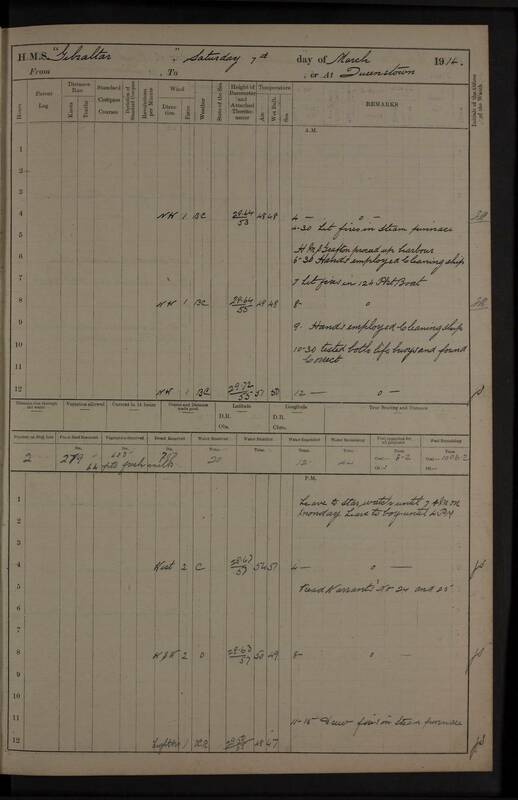 pm: Captain of ENDYMION boarded German steamers off Falmouth. 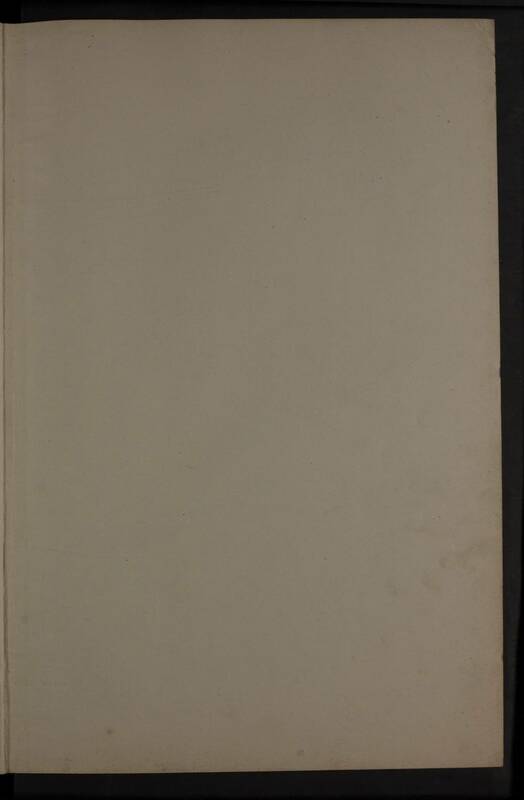 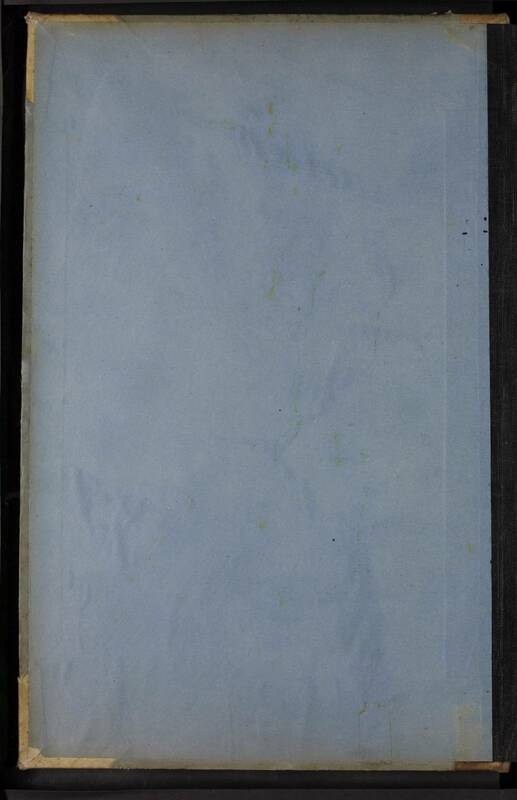 6.00 pm: Stopped discharged Mr. John Baggett, Signal Boatswain, to EDGAR. 5.00 am: Boarded Swedish S.S. DROTH (Capt Johhnsson). 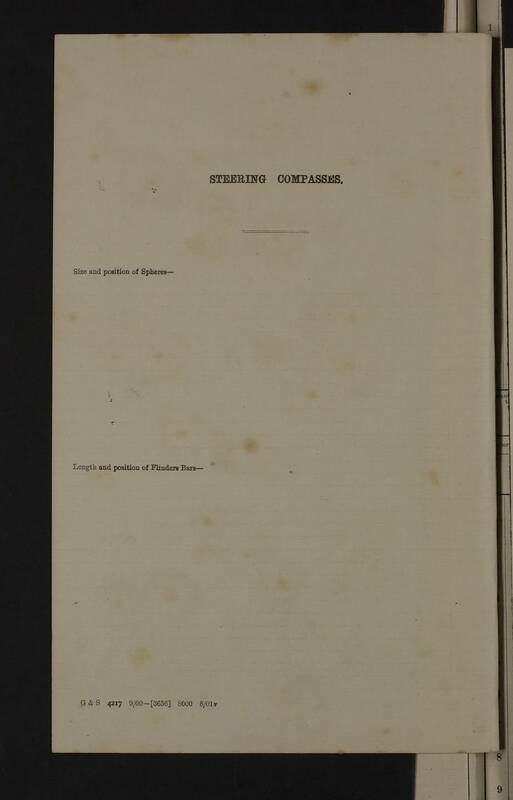 Examined steamer and allowed her to proceed. 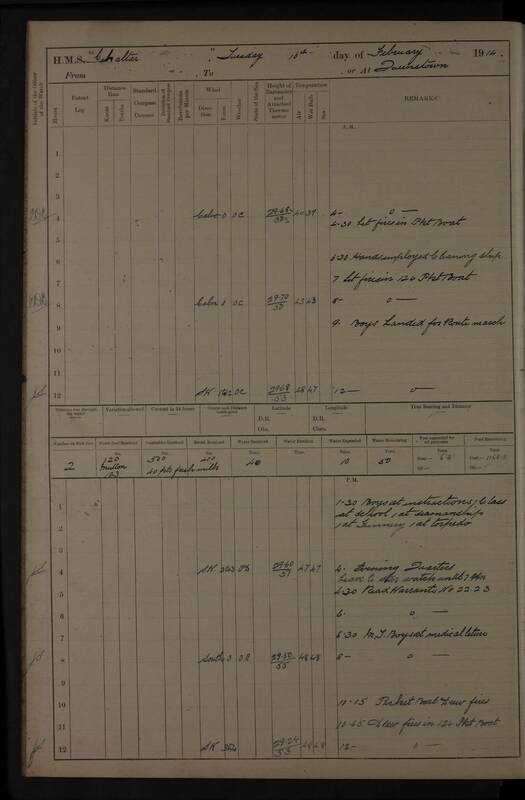 pm: Mr. William Caldwell, Boatswain, rejoins the ship from hospital. 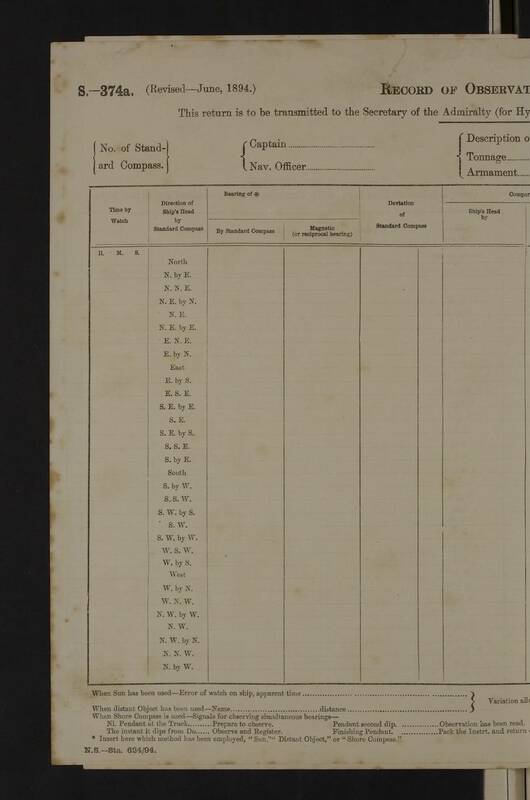 7.00 am: GRAFTON proceeds out of harbour. 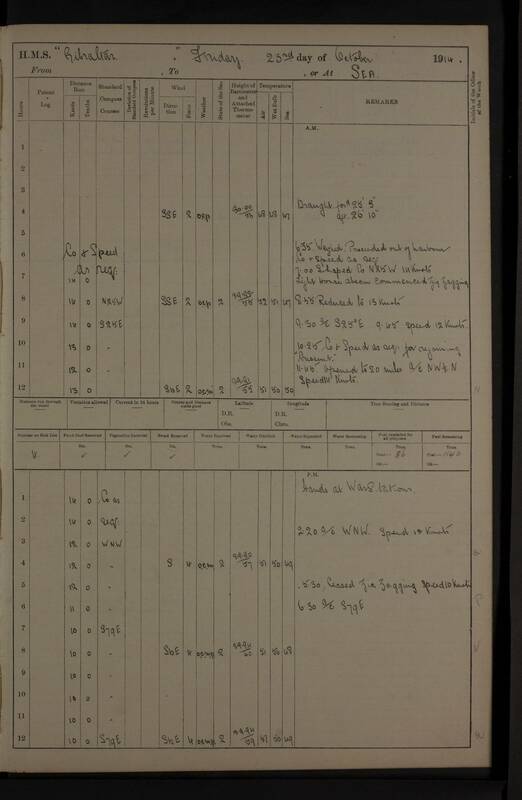 9.00 am: Weighed Co & speed as req: for leaving harbour. 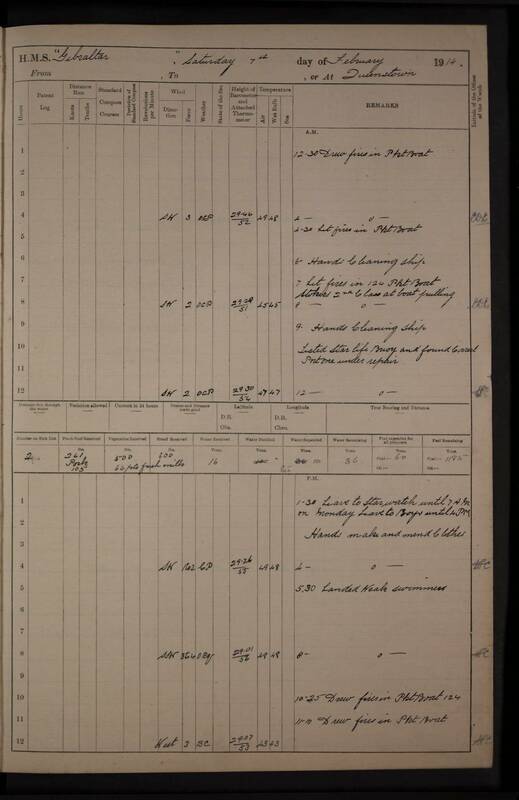 am: Lost overboard 1 Sounding Machine Lead by accident. 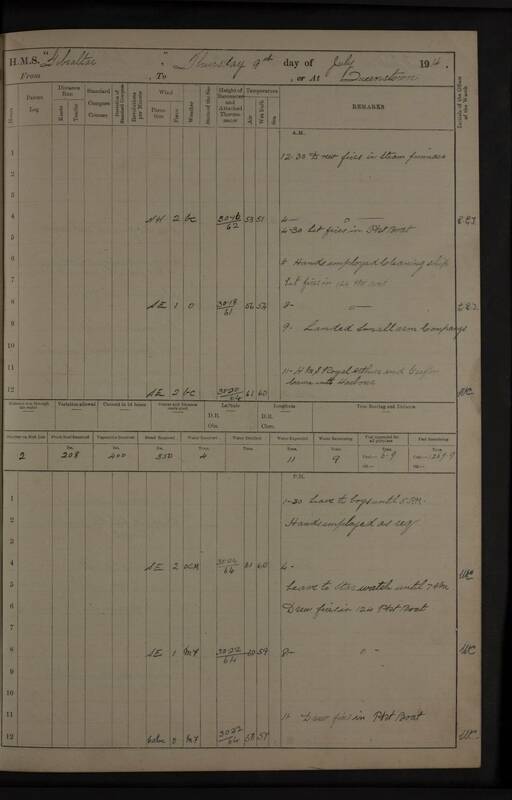 8.35 pm: Chasing steam ship to Southward. 4.35 pm: Weighed and proceeded leaving Busta Voe. 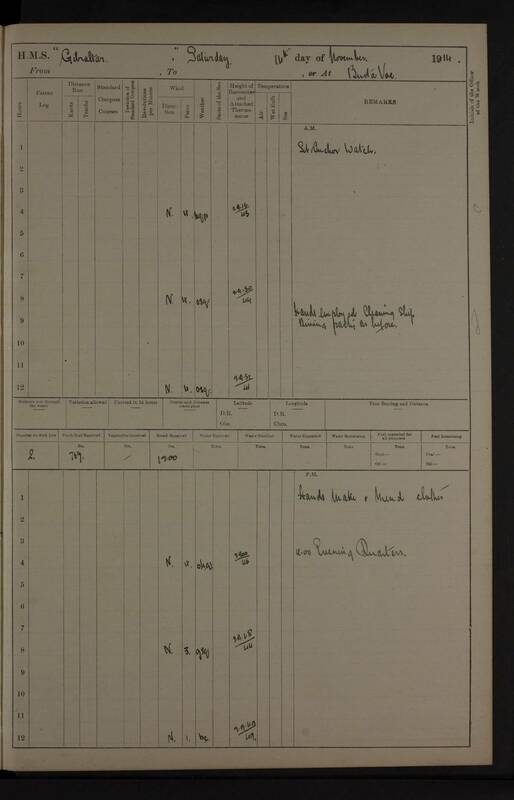 No scan for 25 November 1914.